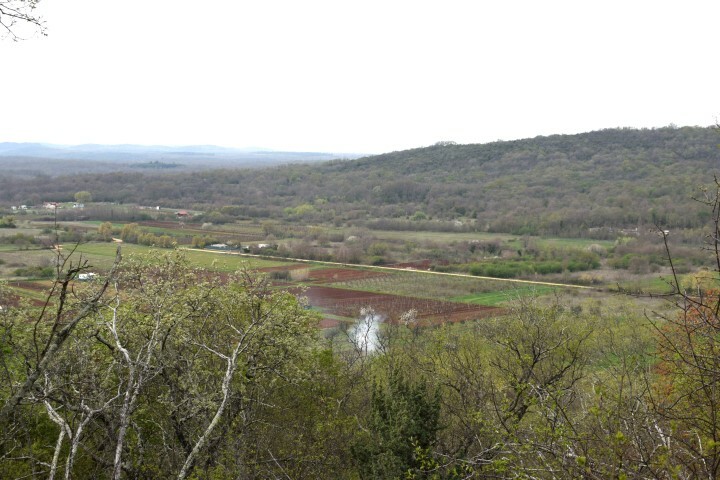 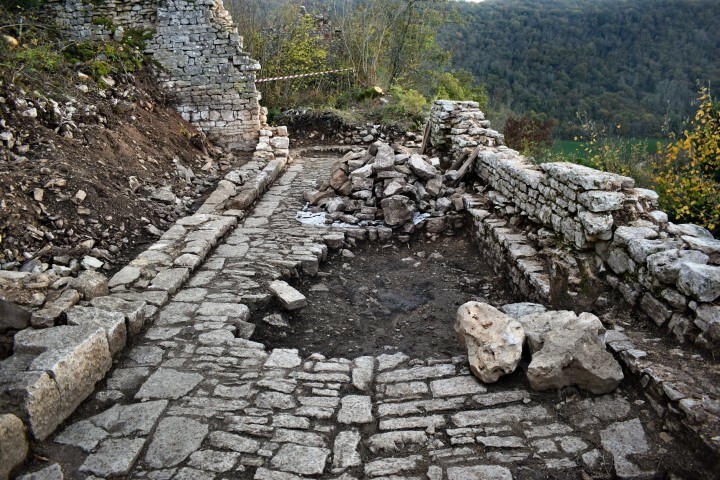 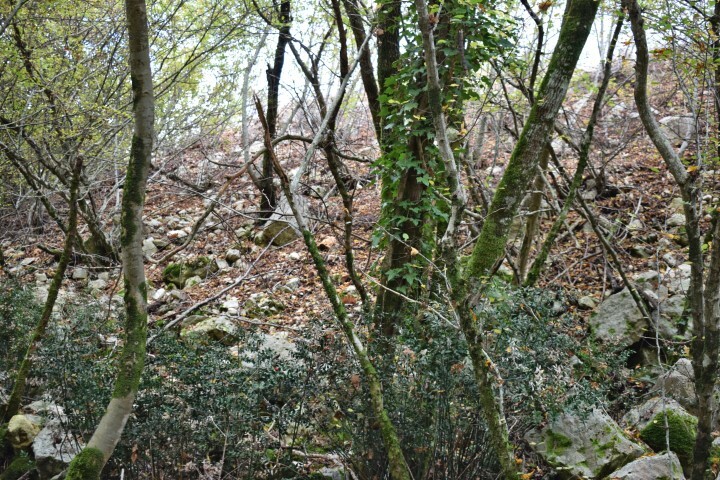 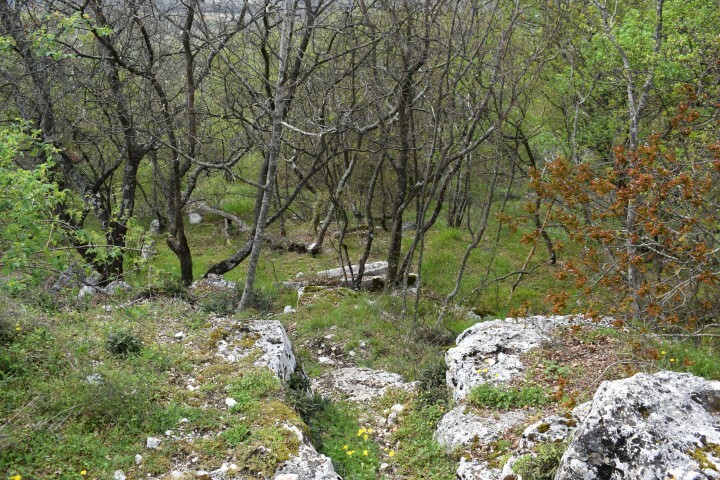 On the top of the Karaštak is a prehistoric hillfort from the metal period (2000 BCE -1 BCE). 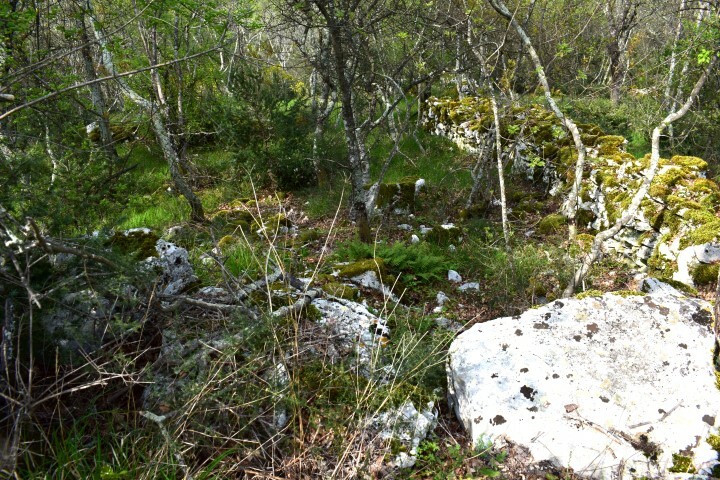 Place: Near Putini – (Kanfanar). 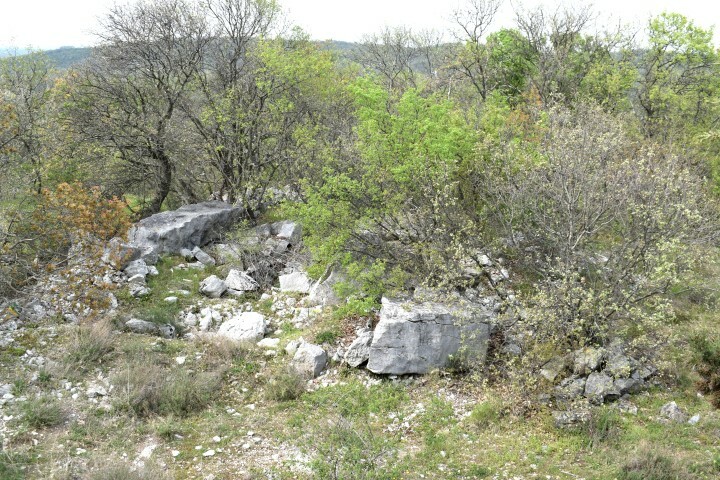 Coordinates: 45.11096 N – 13.73602 E.
Place: Near Galiyana – (Vodnjan). 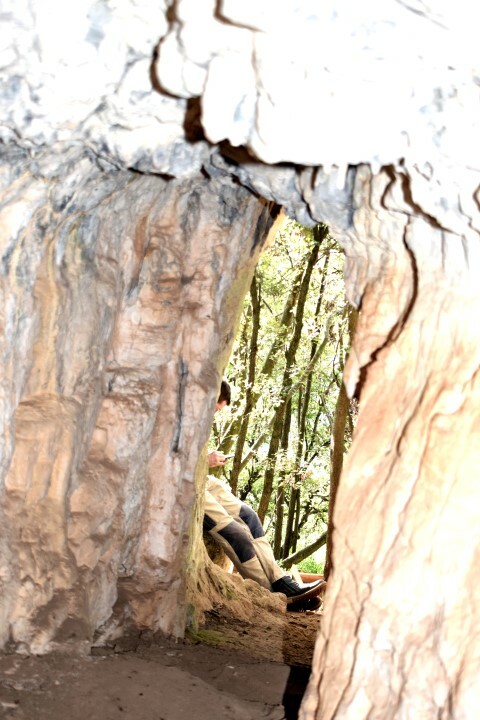 Coordinates: 44.939319 N – 13.895229 E.
Name: Bay Blaz – Golf Raša. 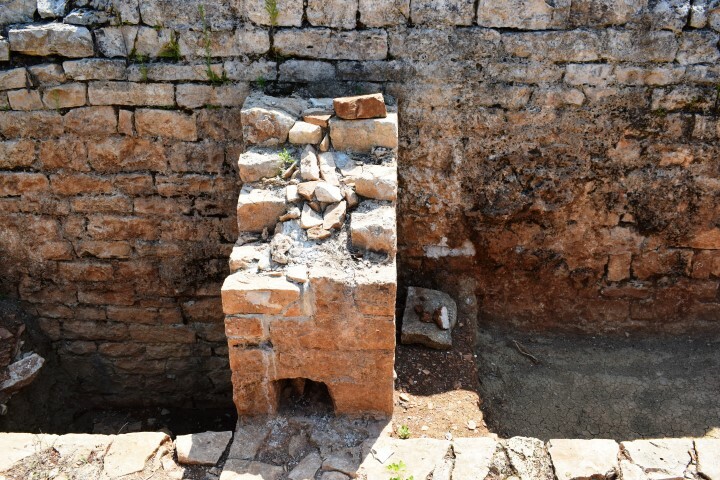 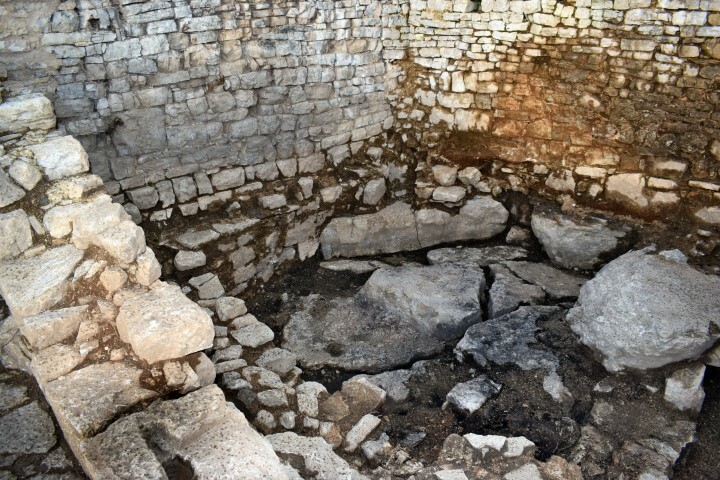 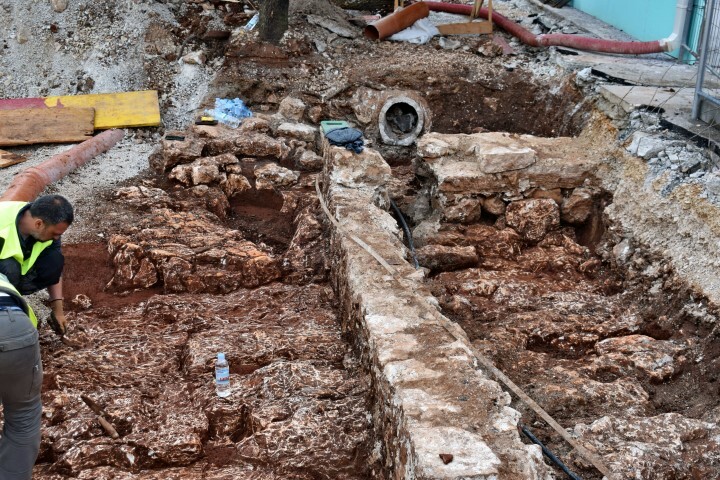 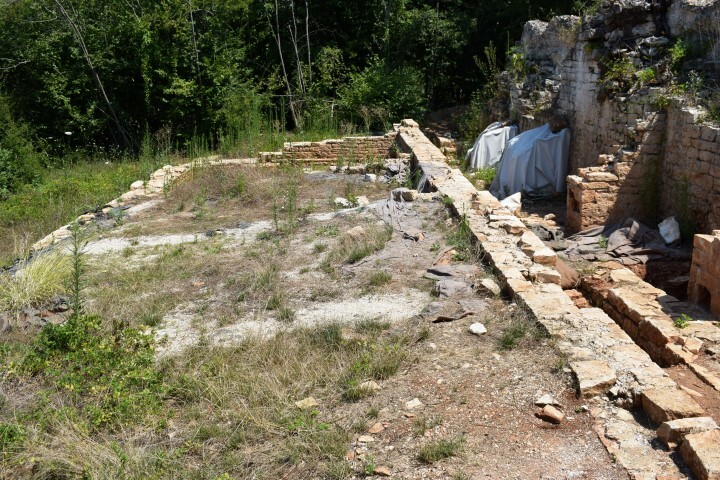 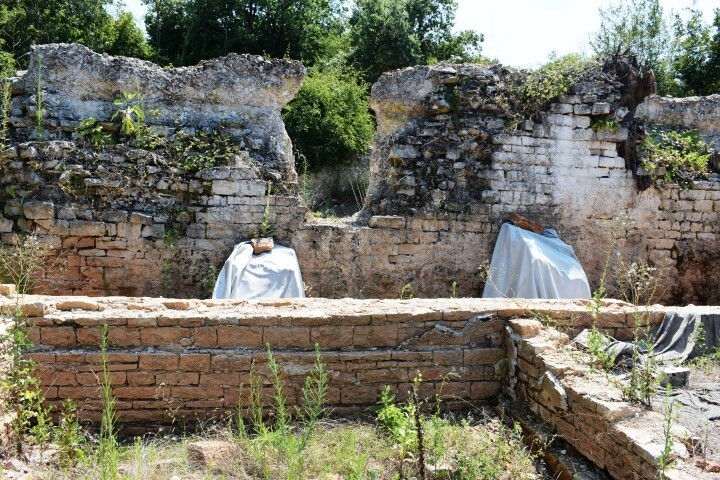 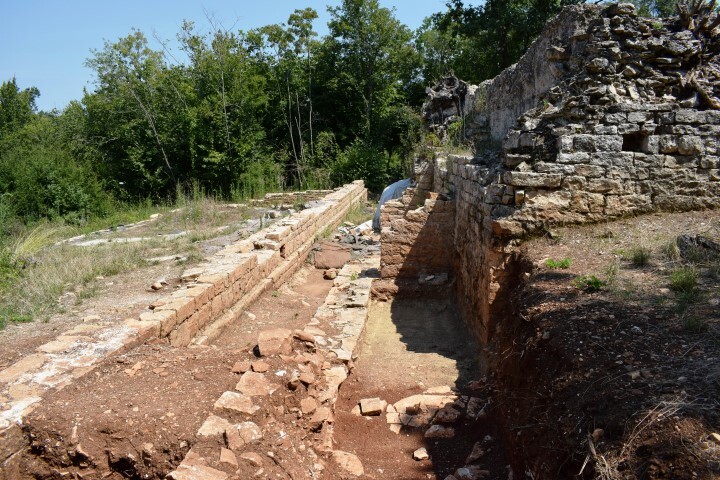 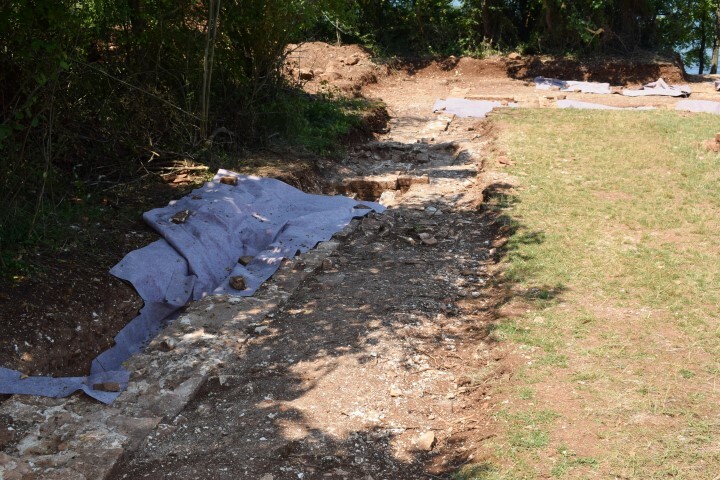 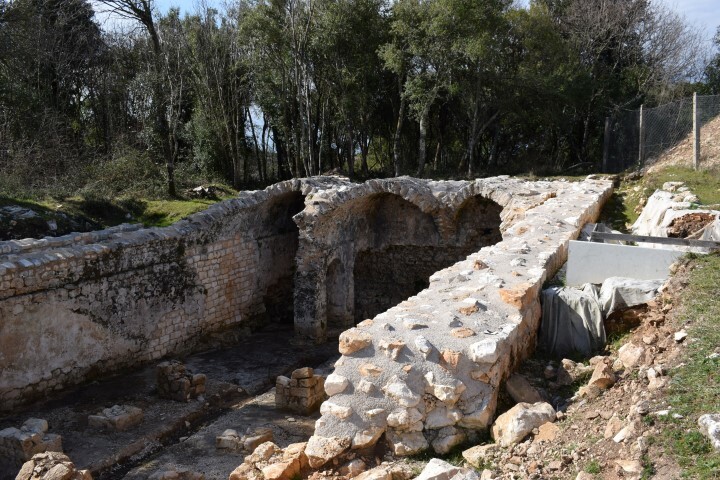 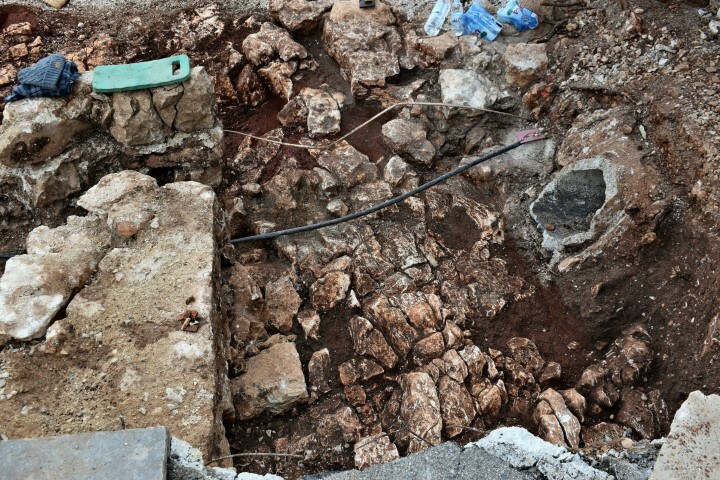 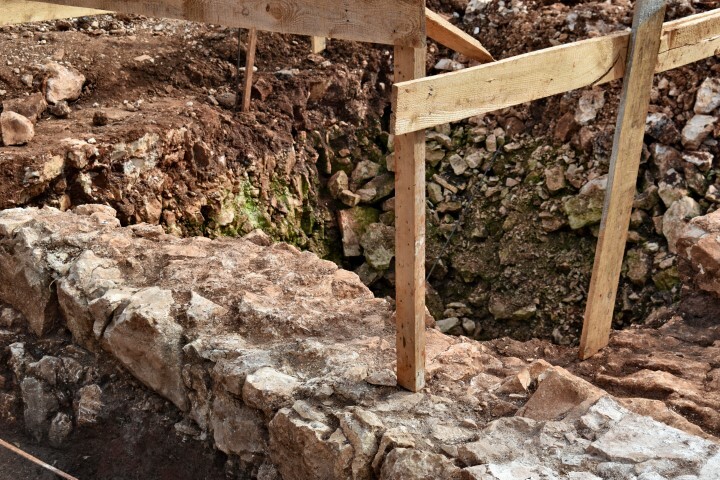 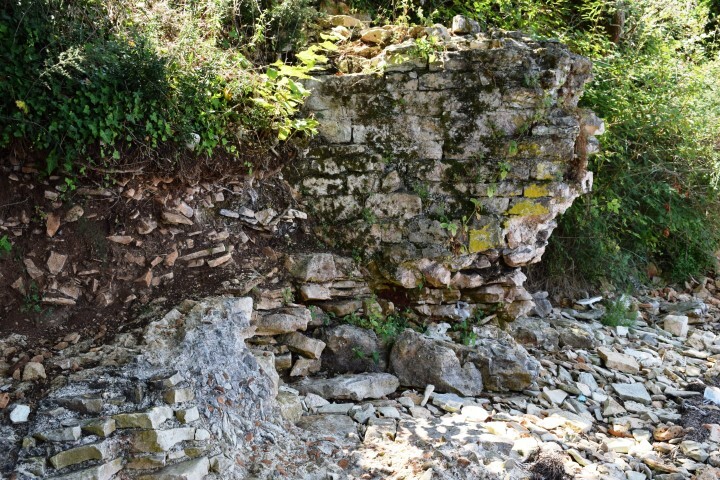 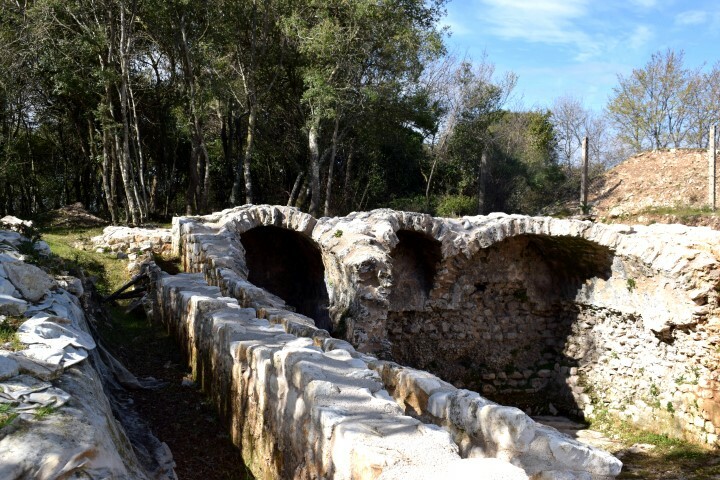 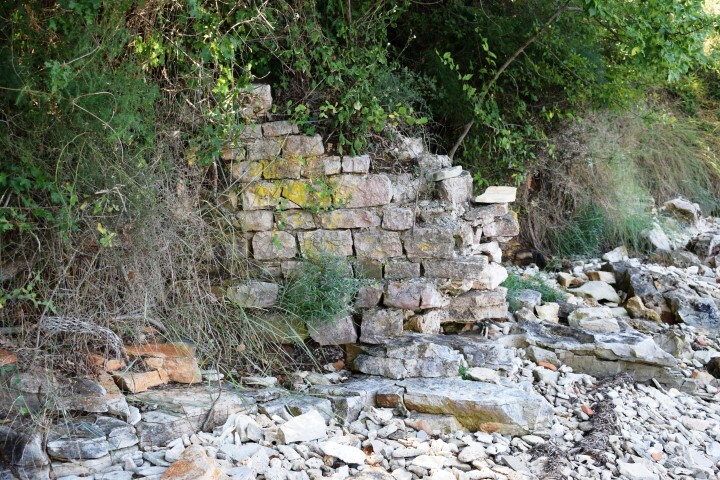 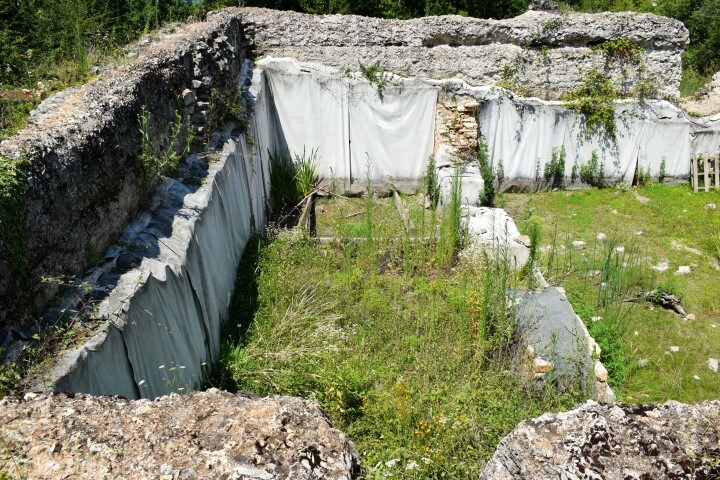 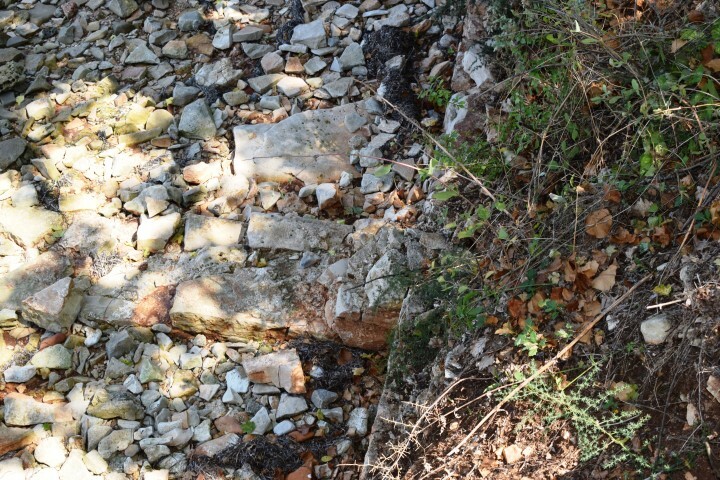 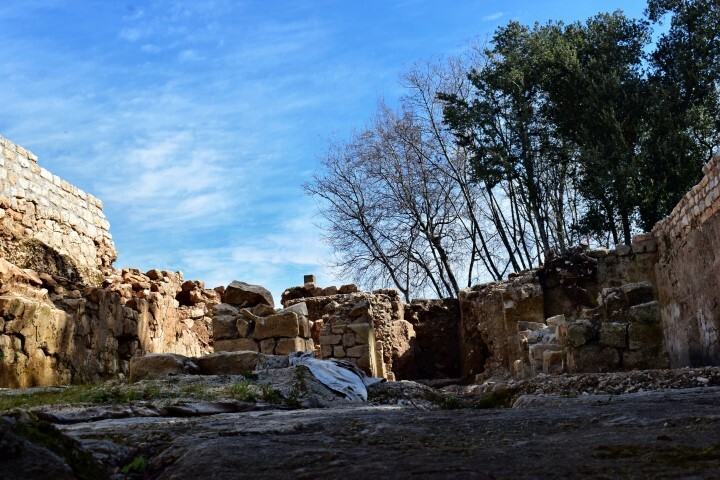 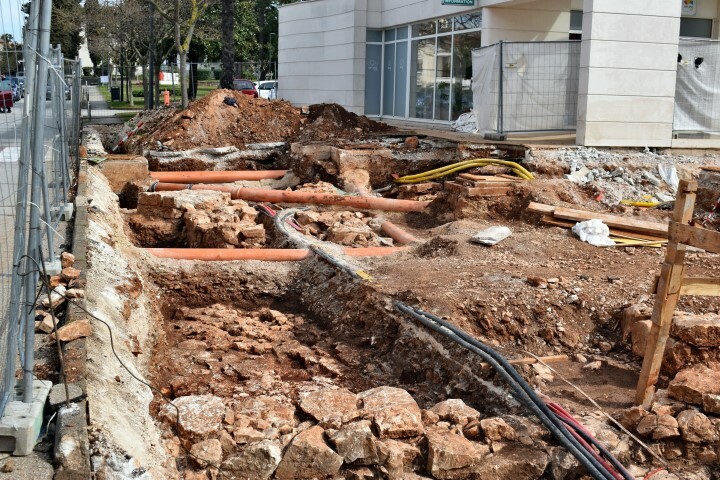 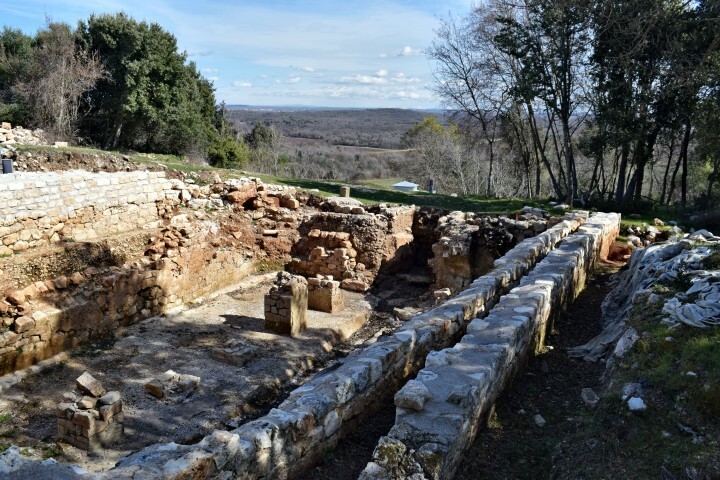 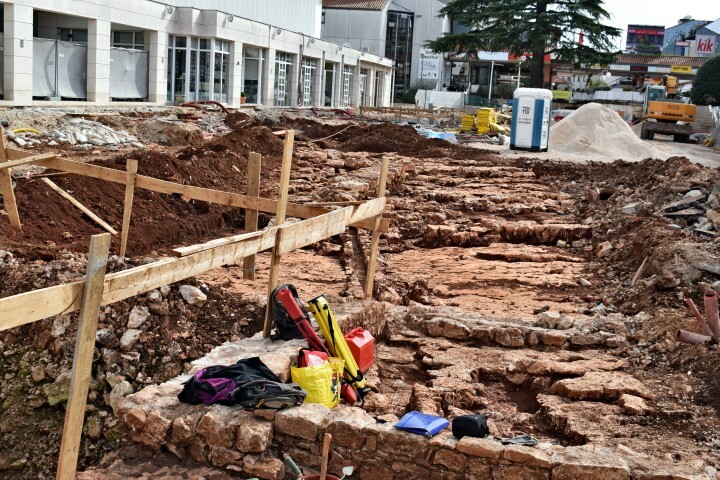 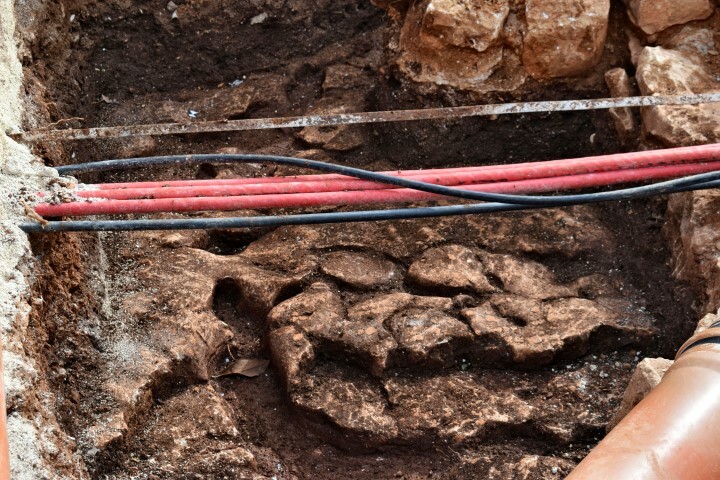 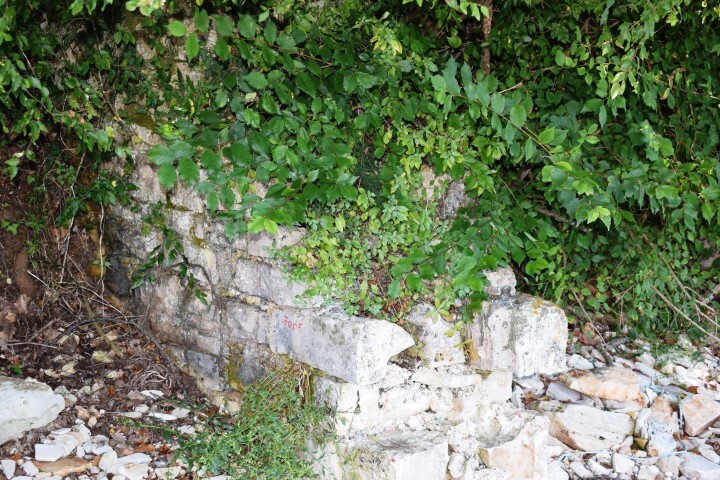 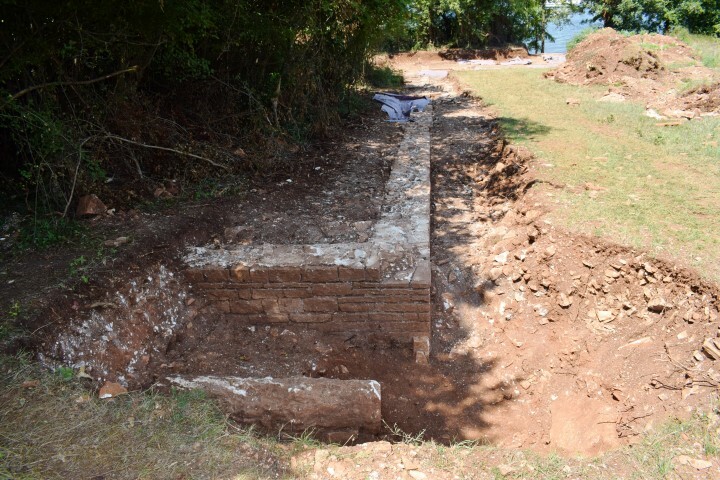 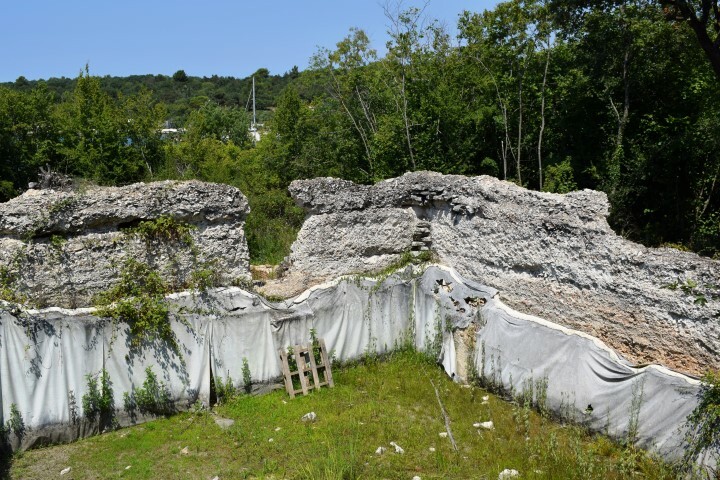 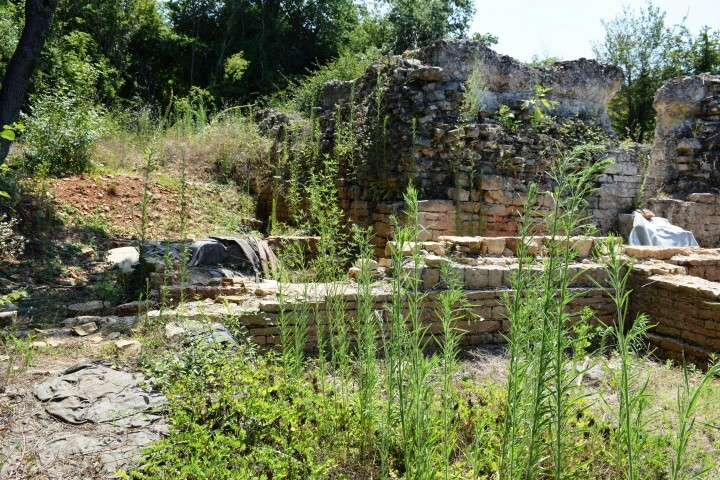 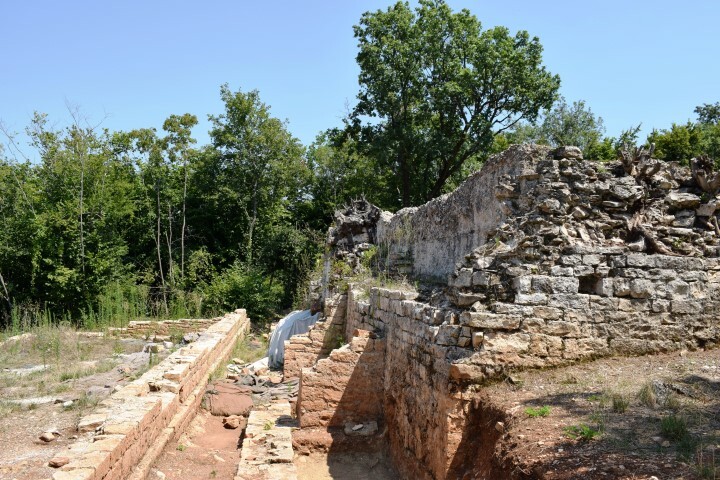 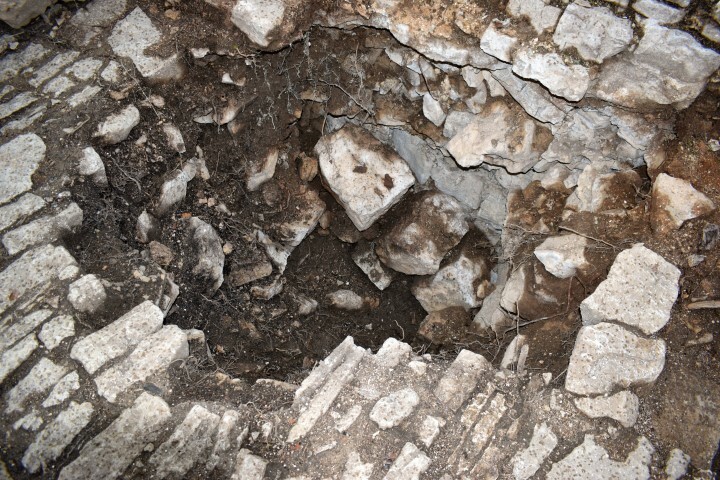 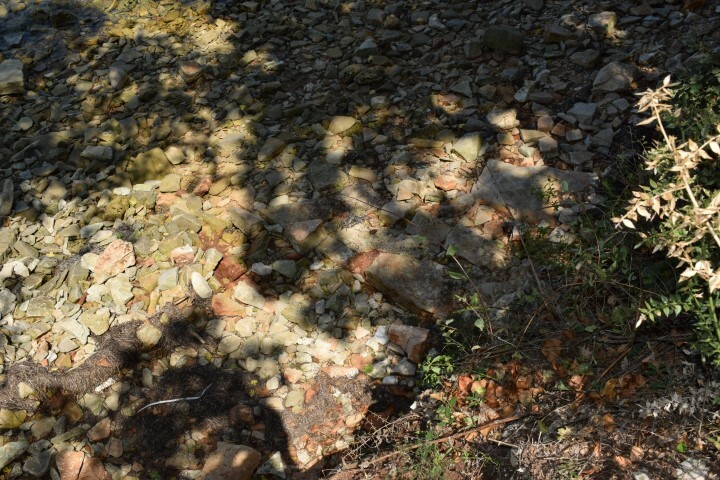 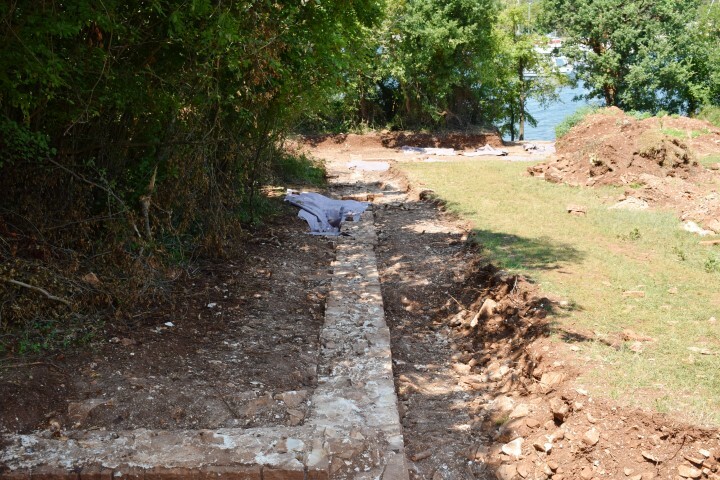 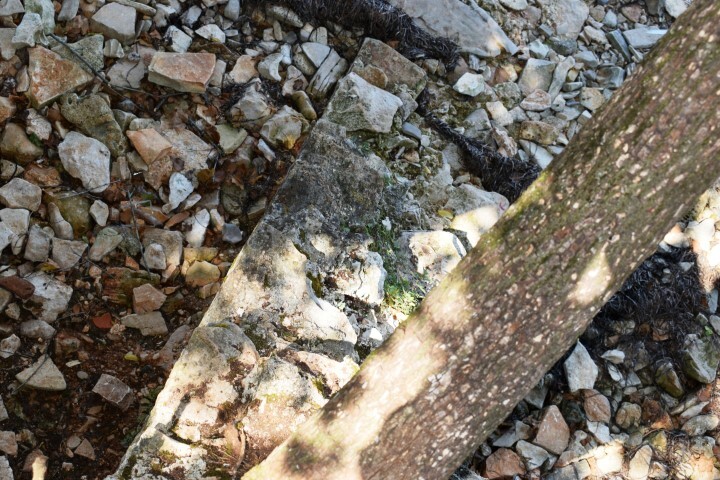 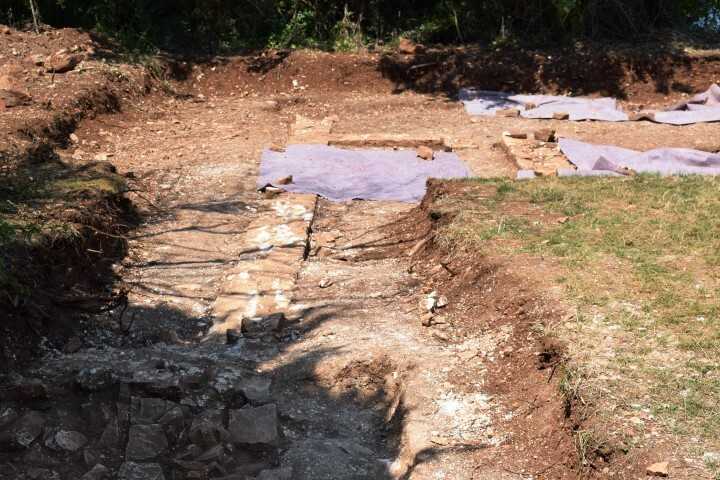 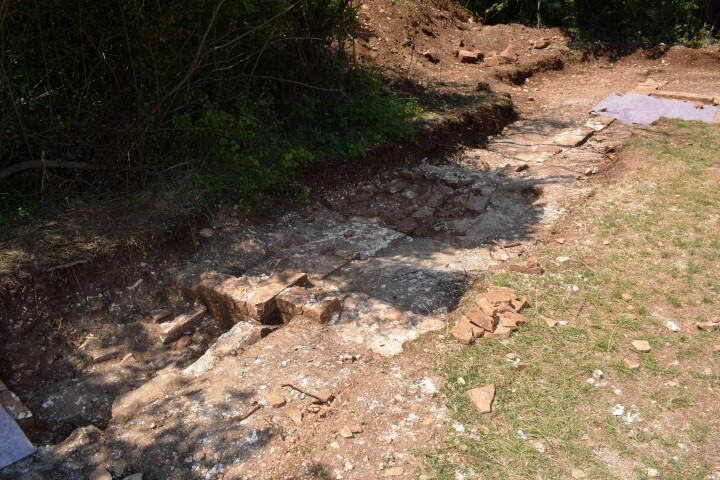 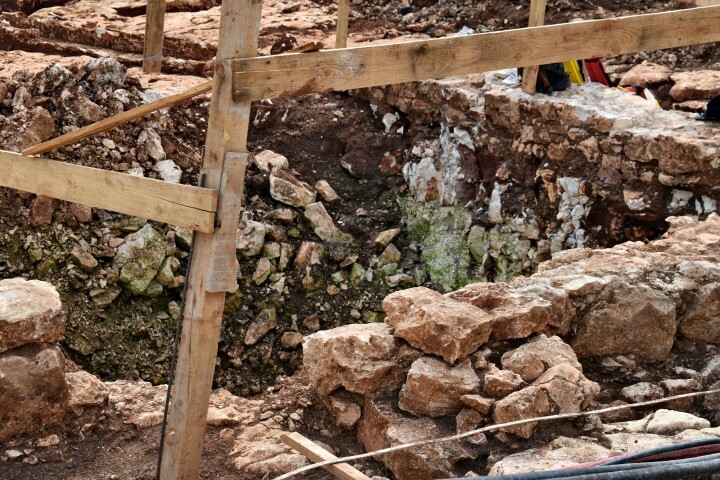 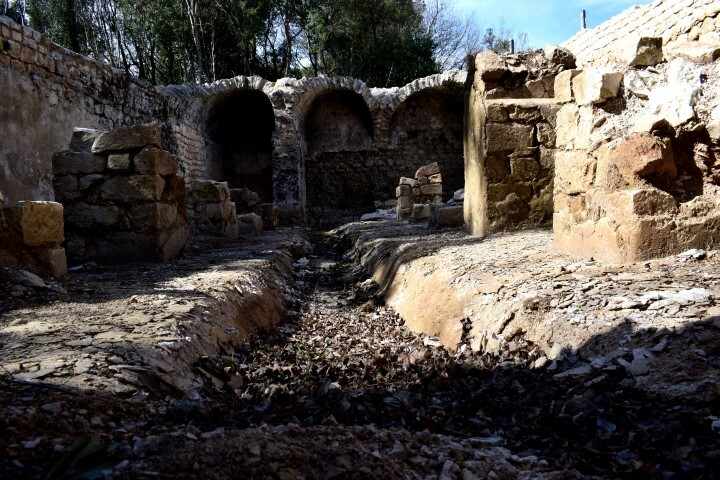 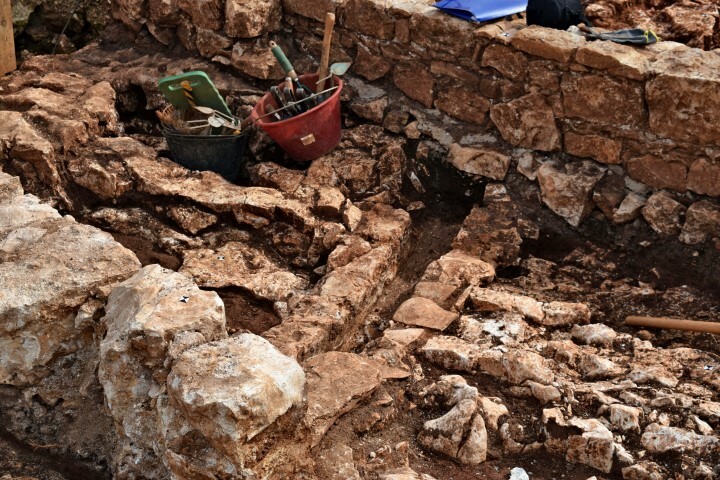 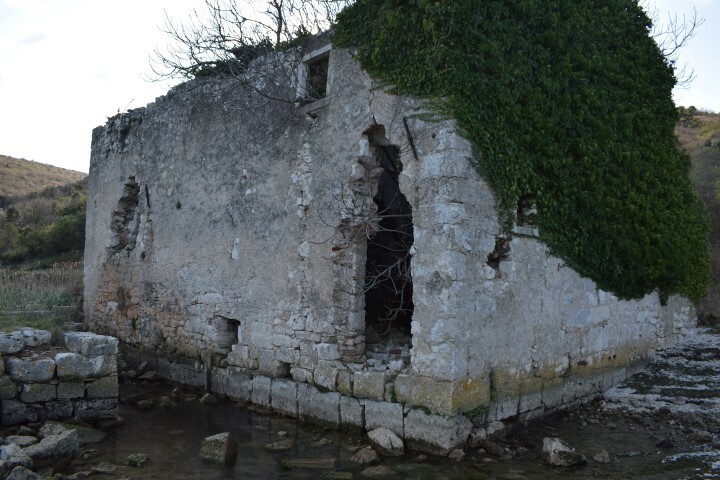 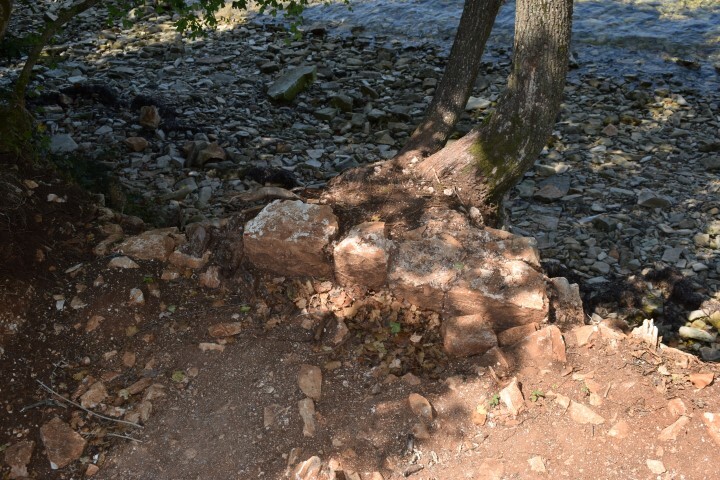 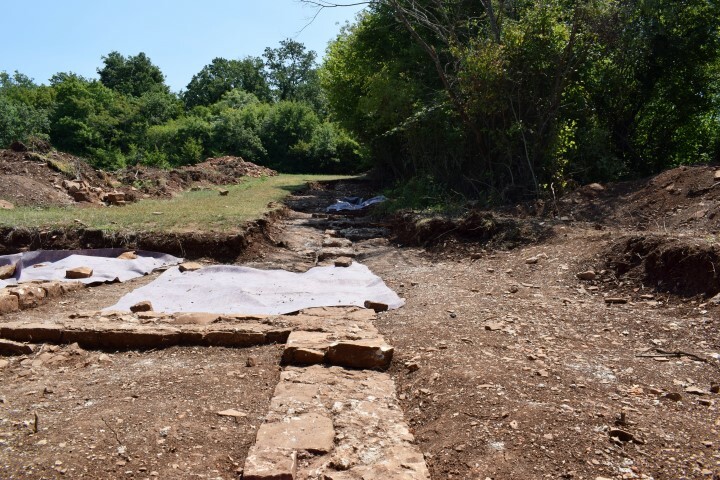 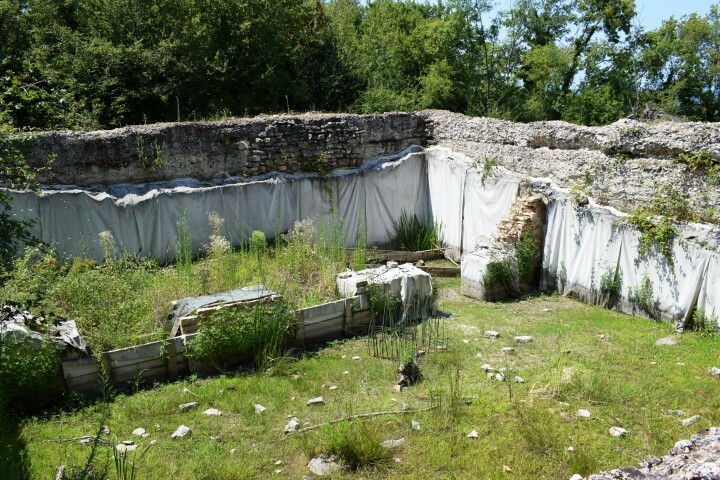 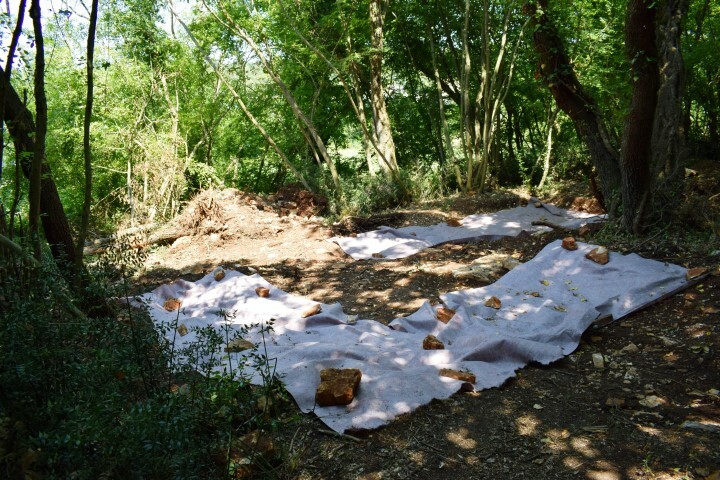 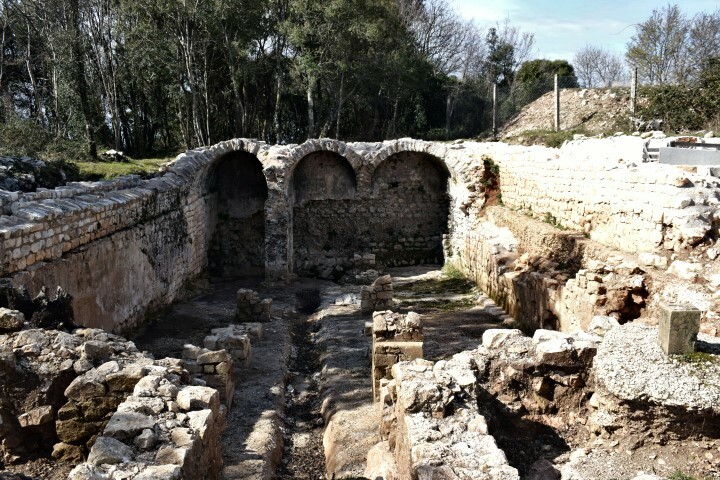 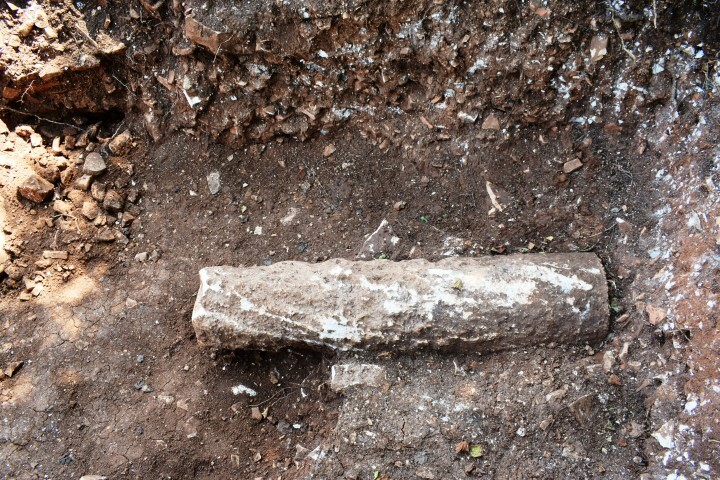 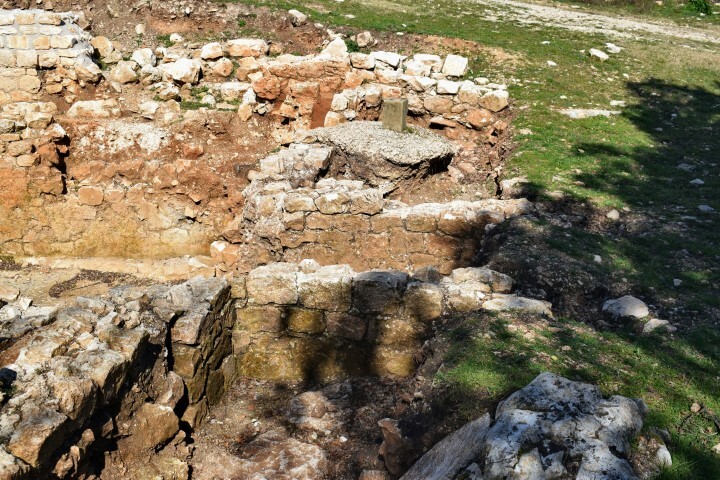 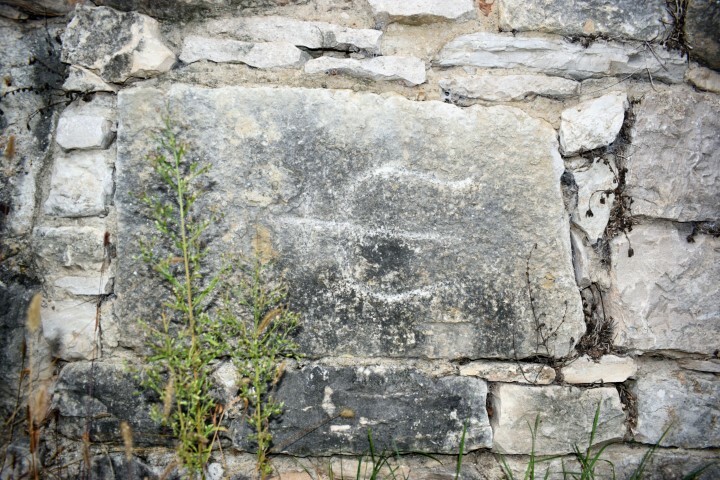 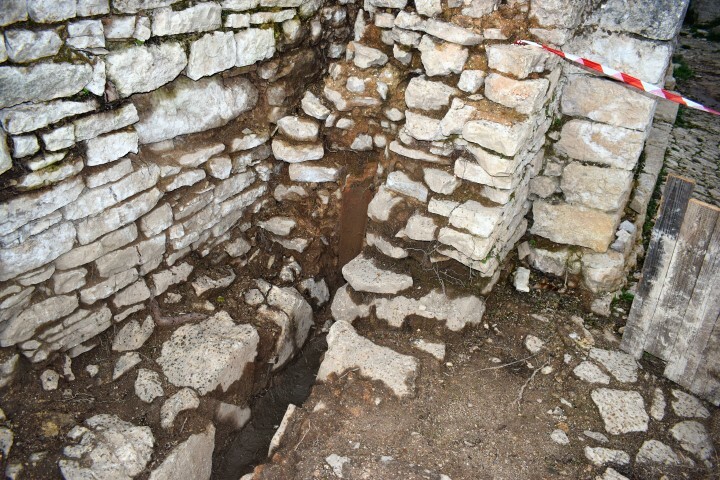 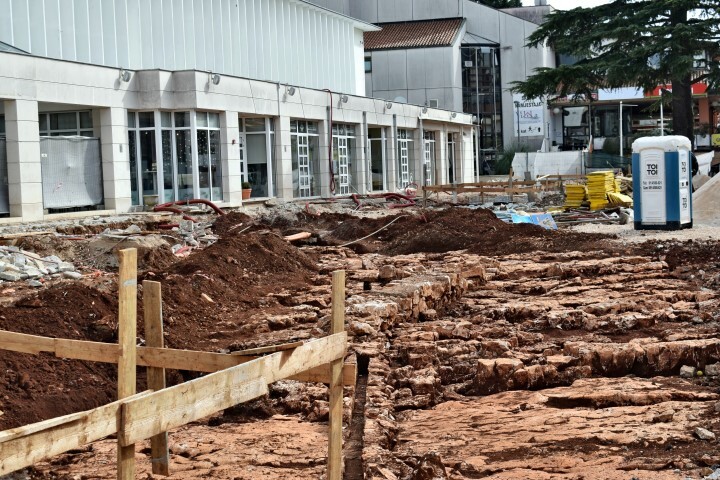 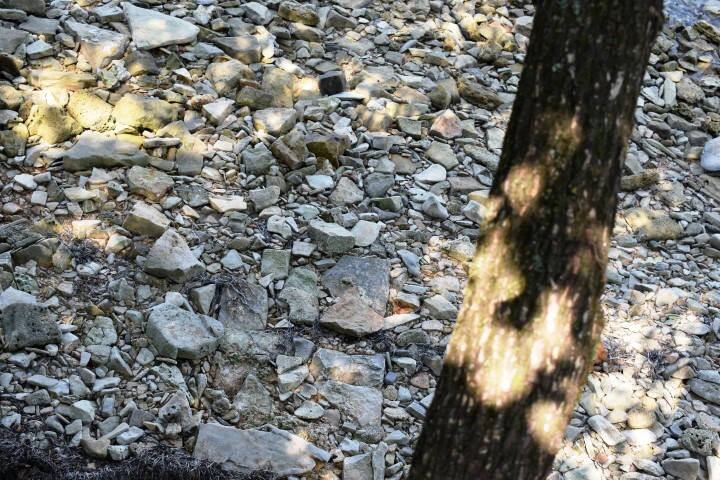 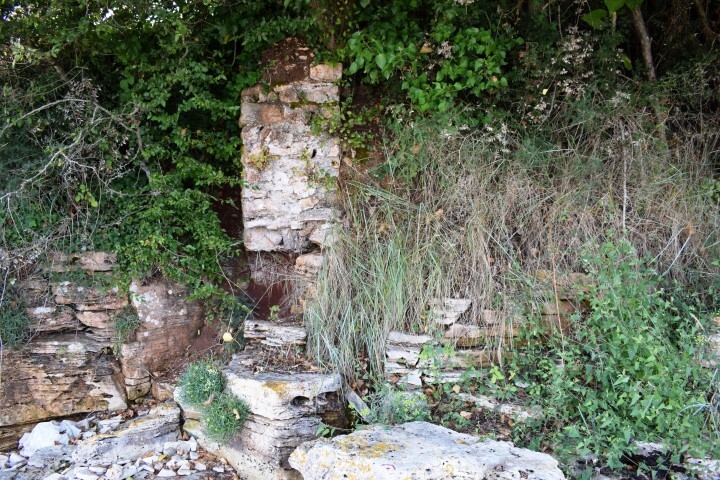 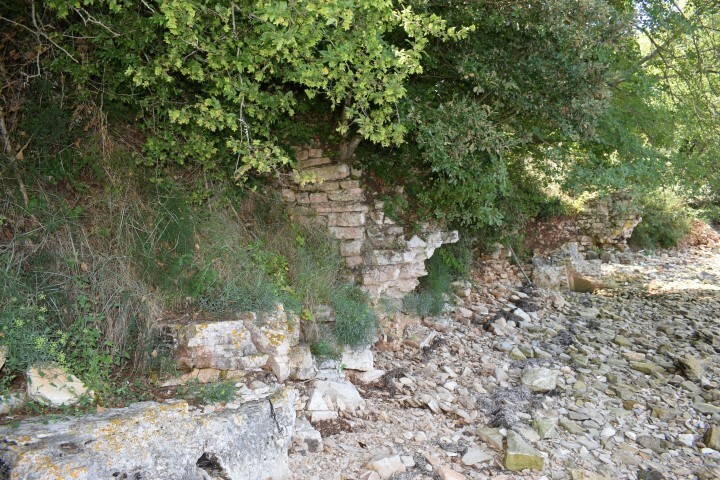 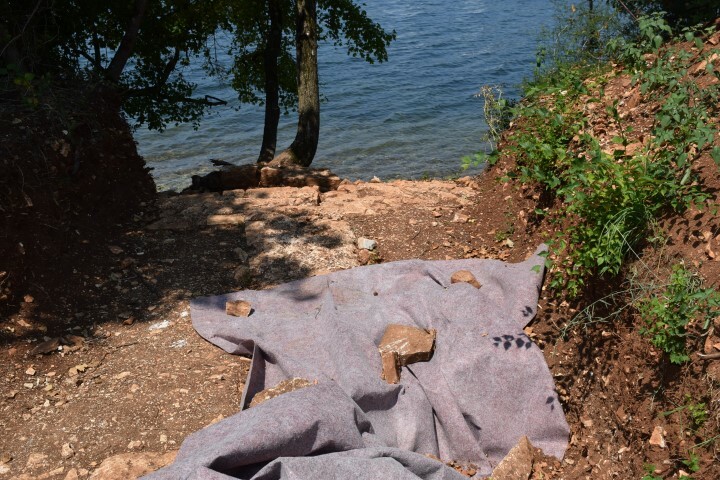 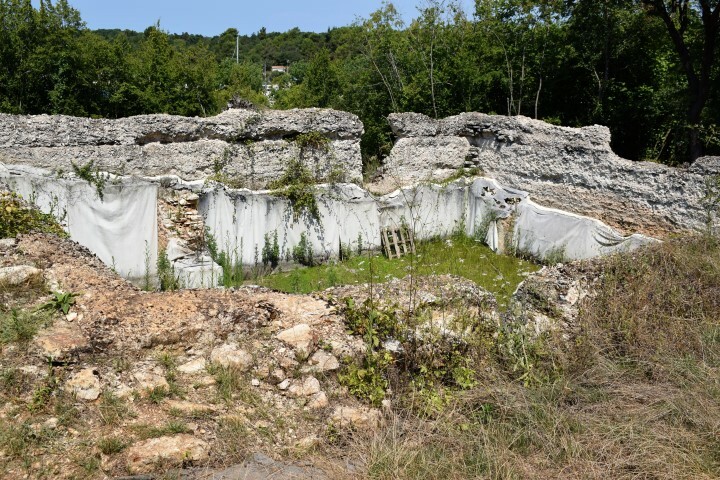 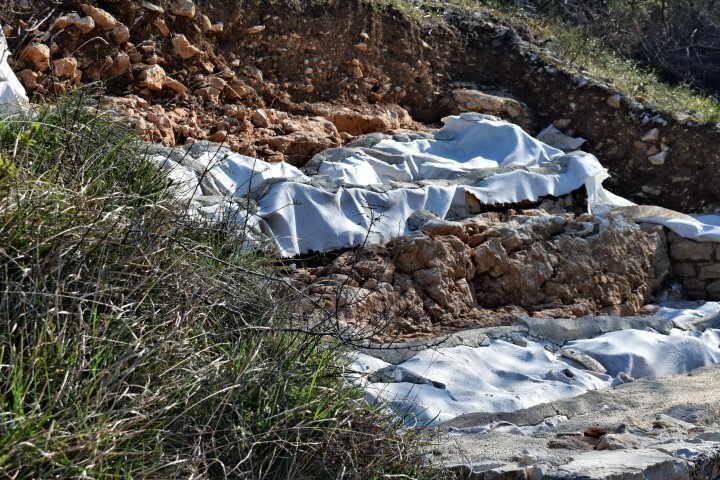 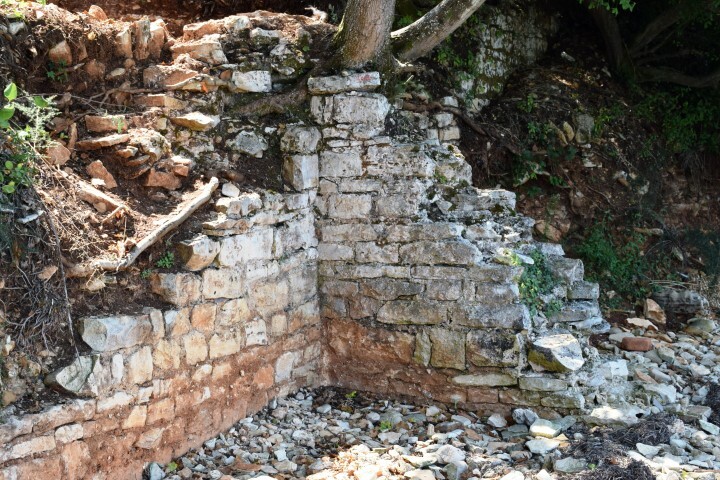 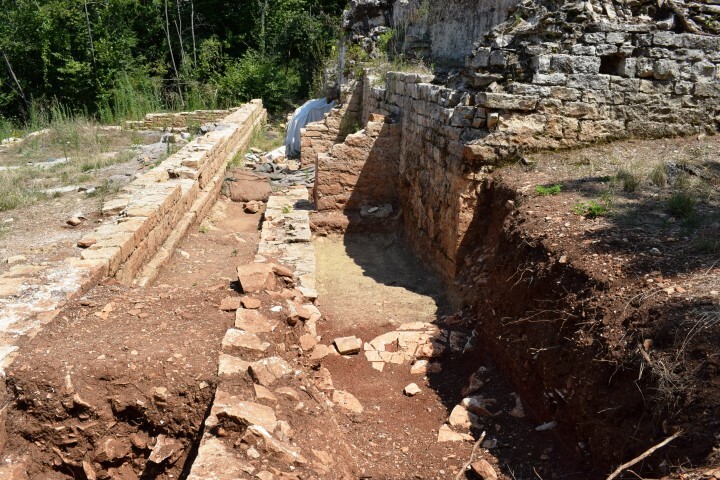 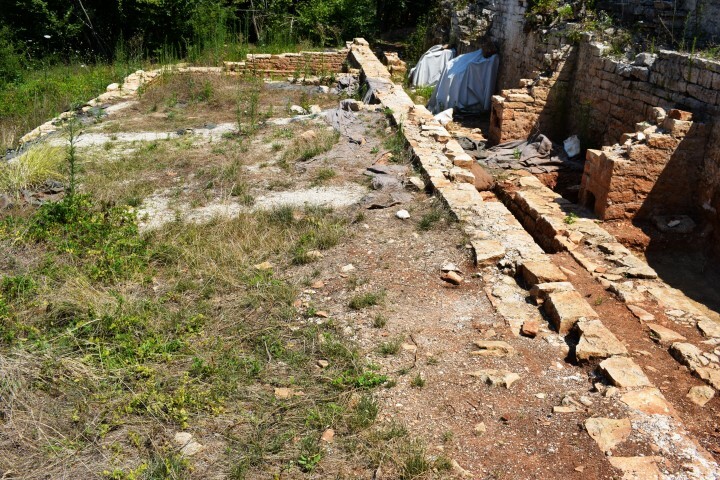 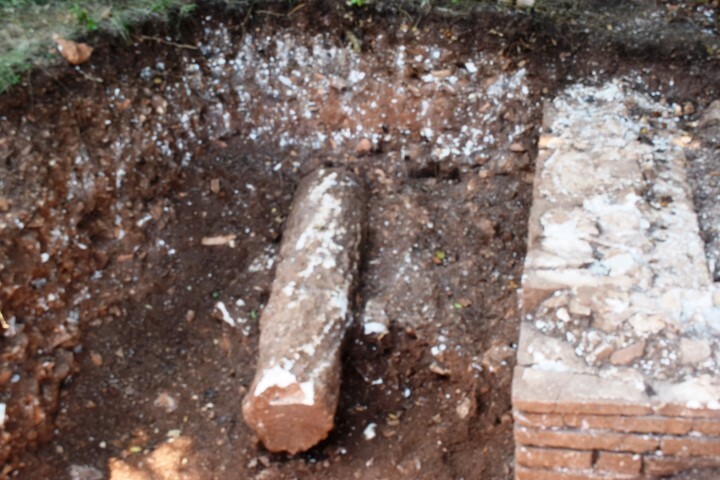 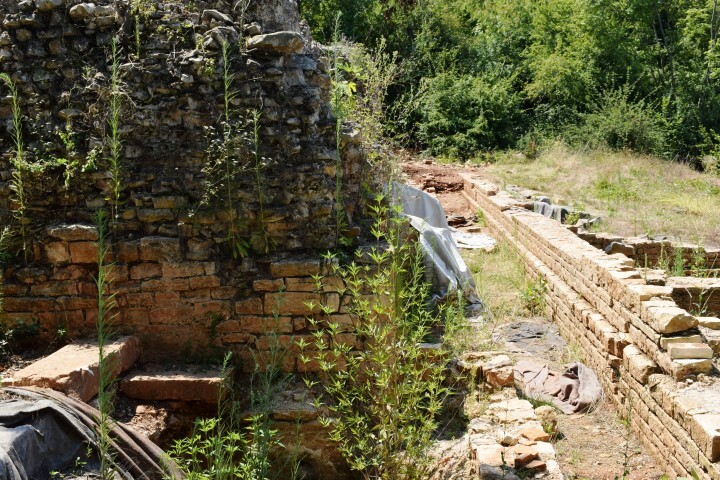 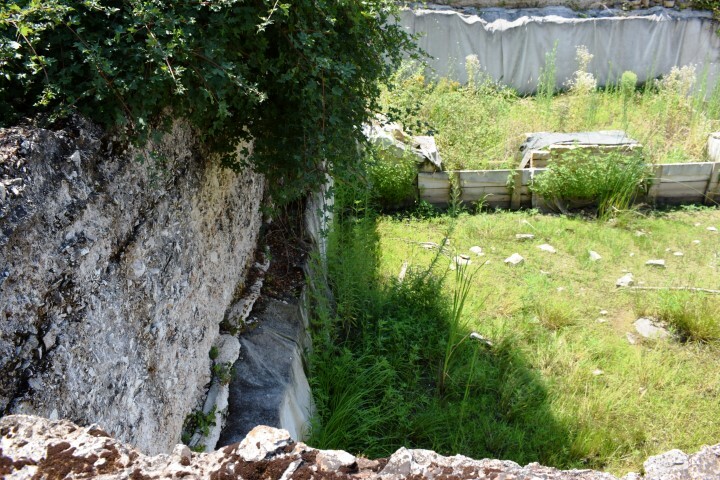 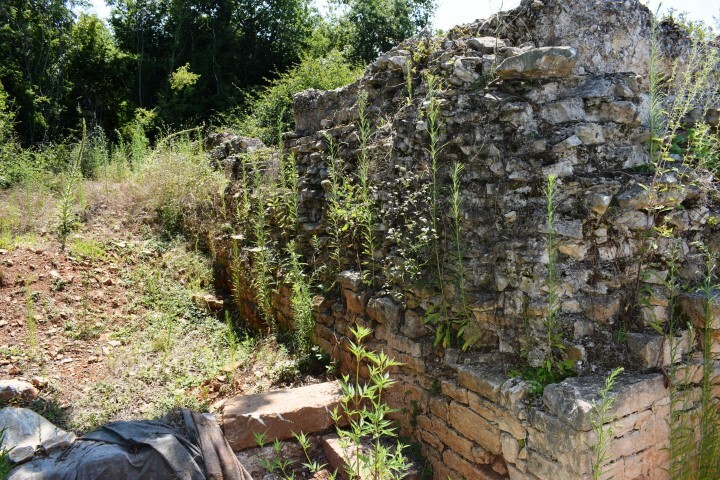 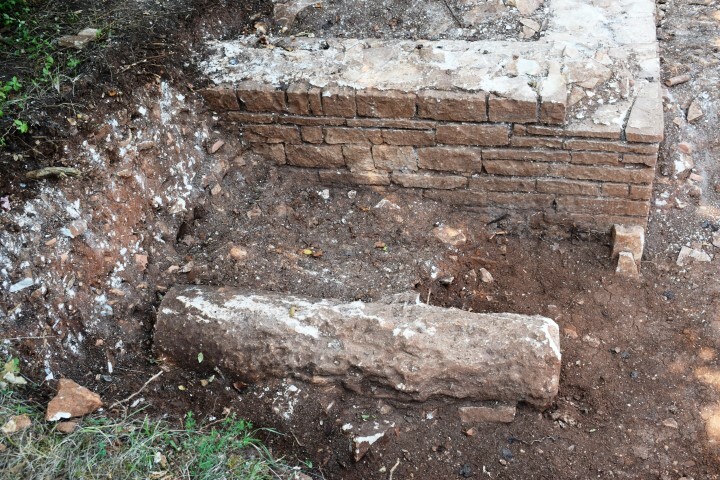 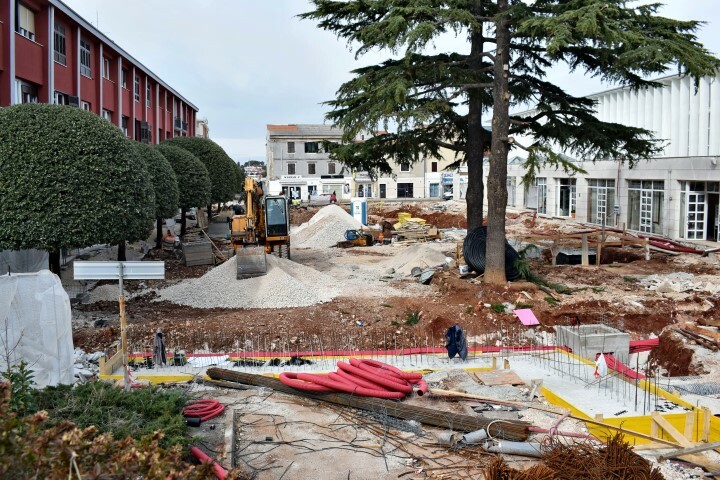 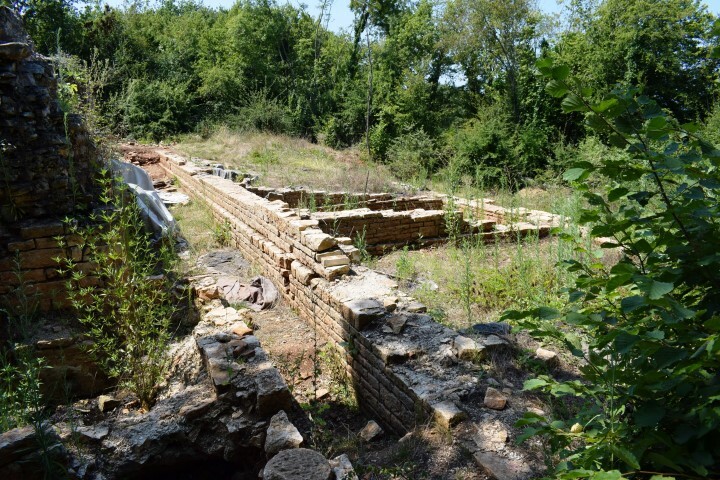 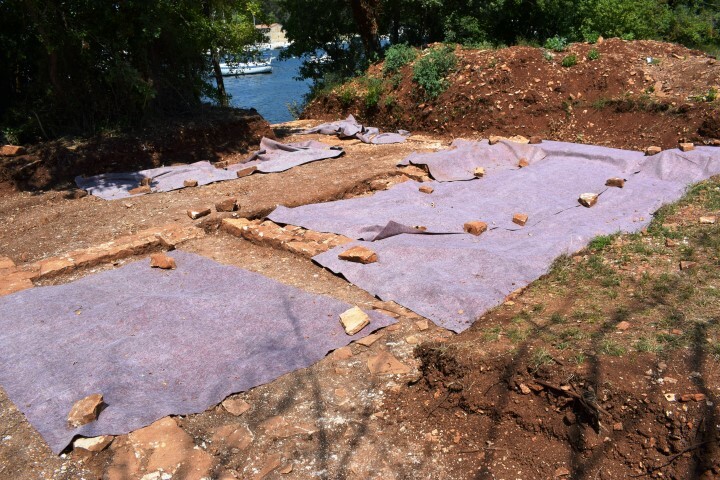 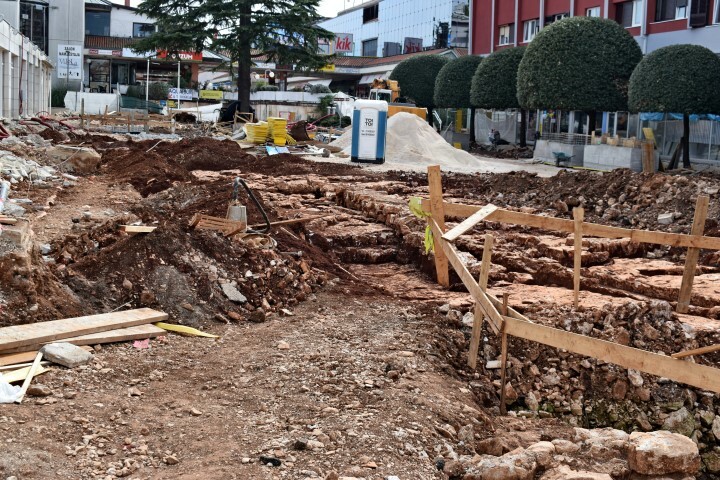 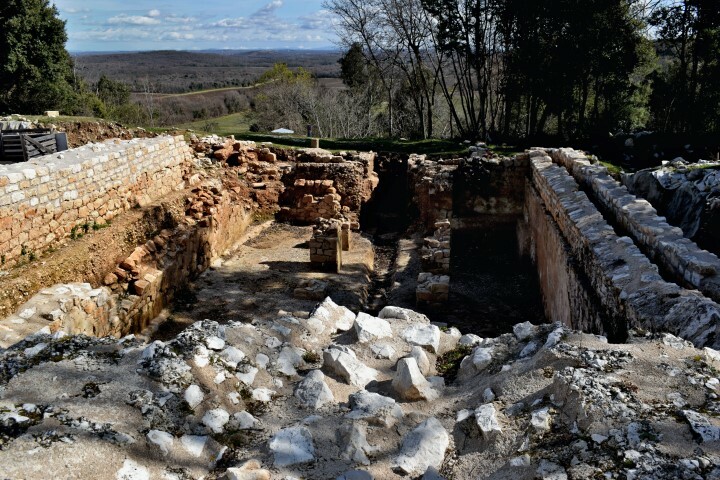 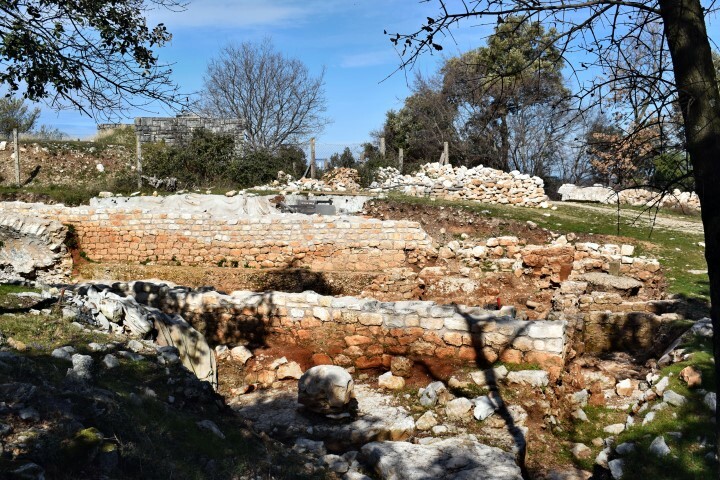 Coordinates: 45.00061 N – 14.03706 E.
Archaeological research: 4500038 N – 14-03921 E.
During the renovation of the square in the Center of Umag at the end of 2018, remains of city walls were found. 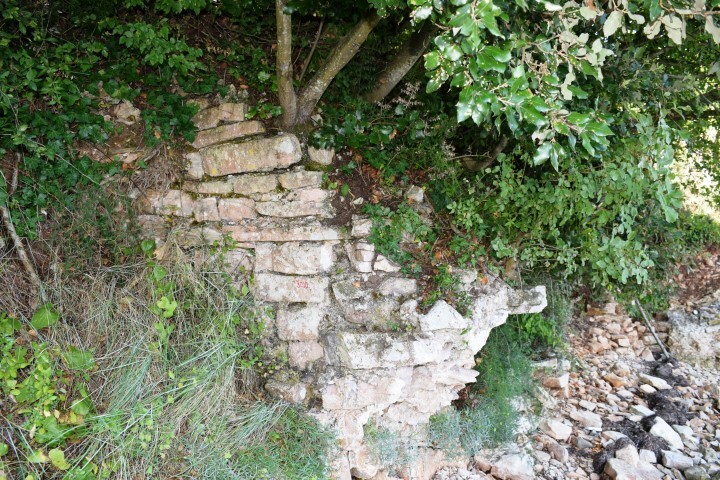 These belonged to the second ring of the city walls from the 14th century. 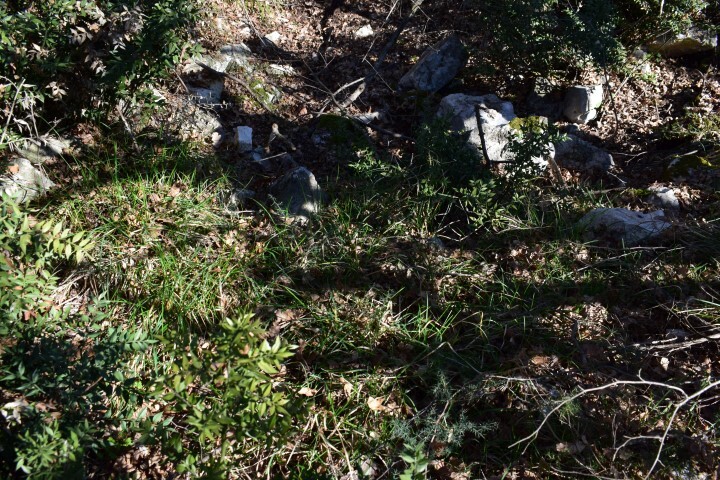 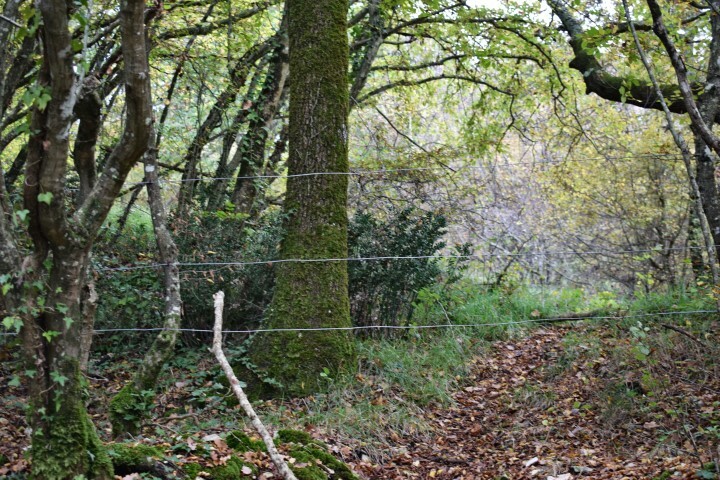 See also the Posts placed 2016-10-11 and 2014-11-22. 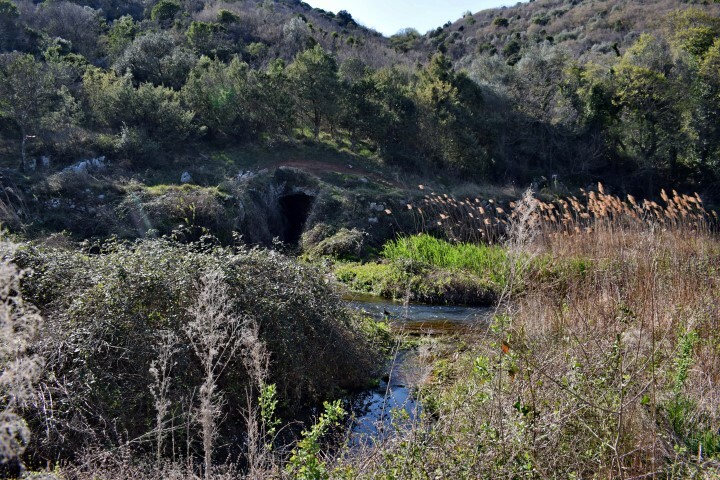 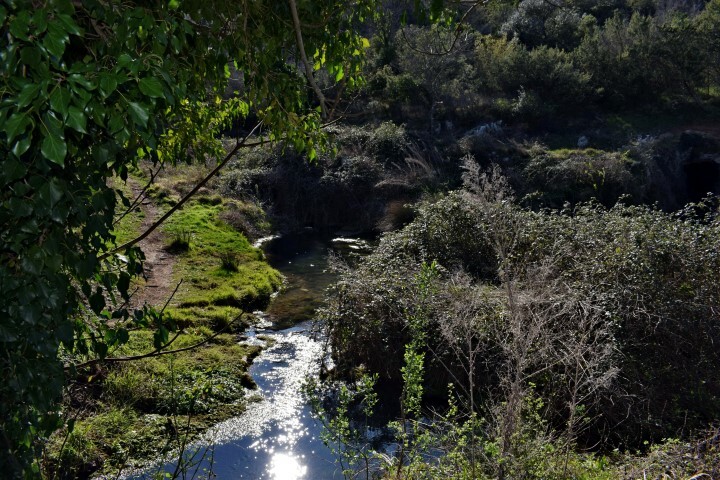 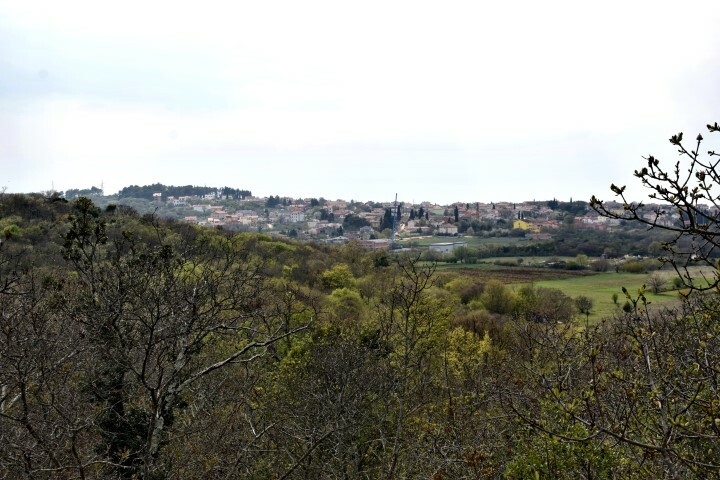 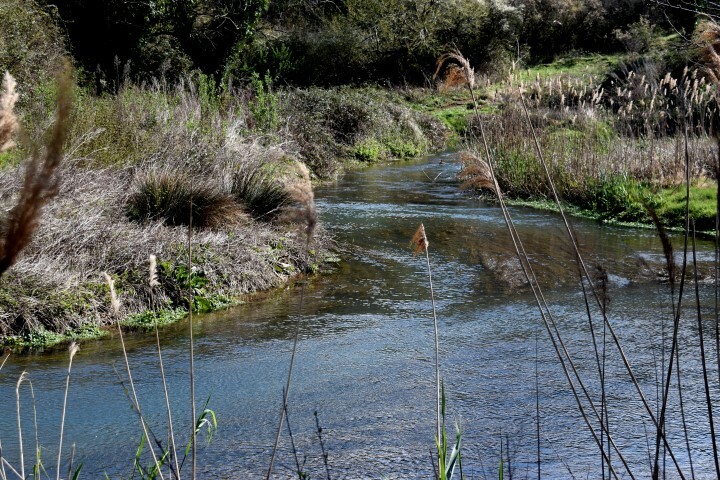 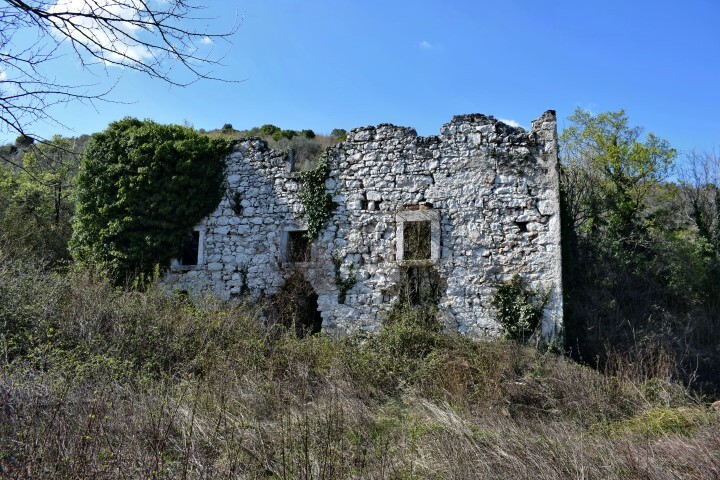 Name: Villa Rustica – Cisterna. 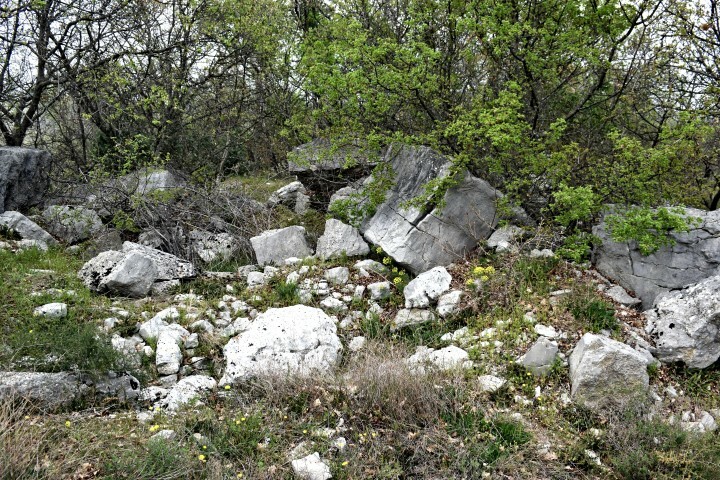 Place: Stancija Velika – (Vrsar). 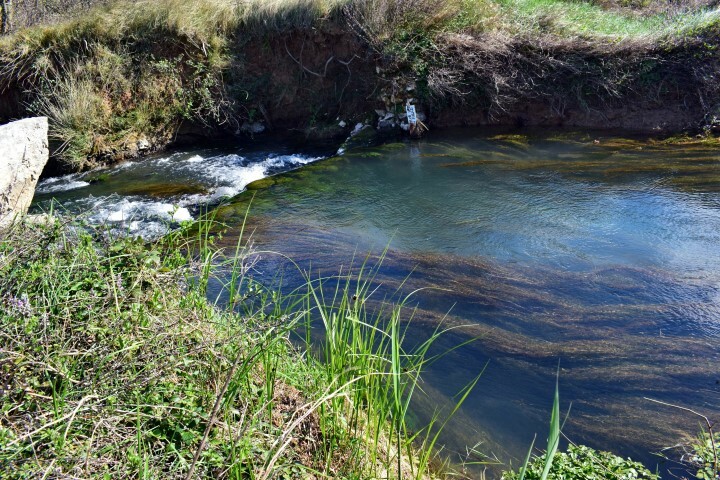 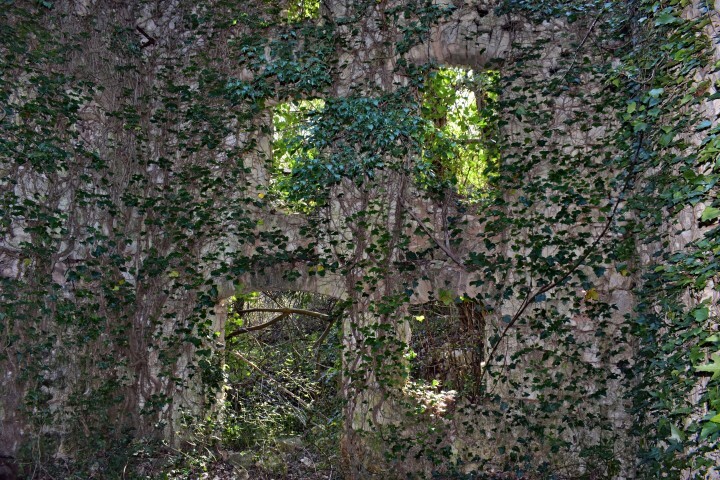 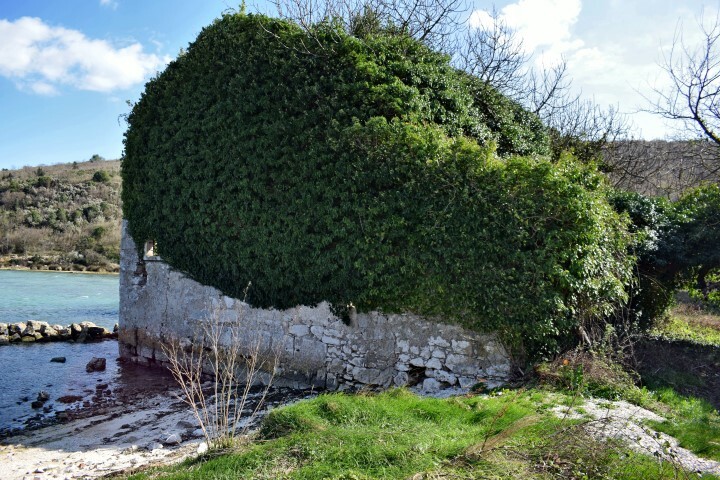 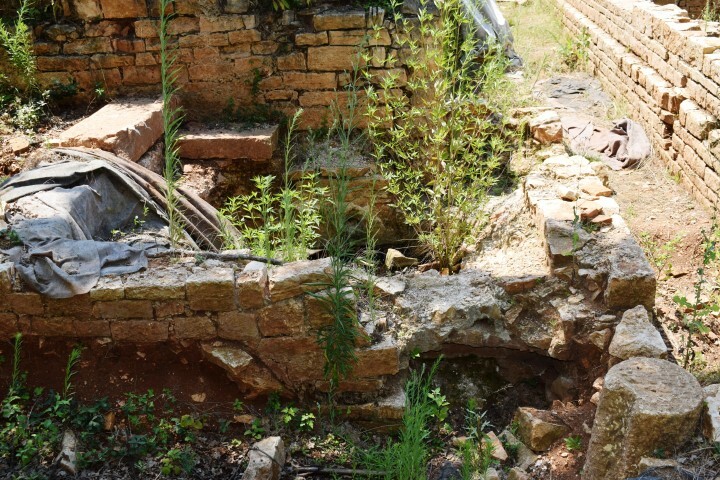 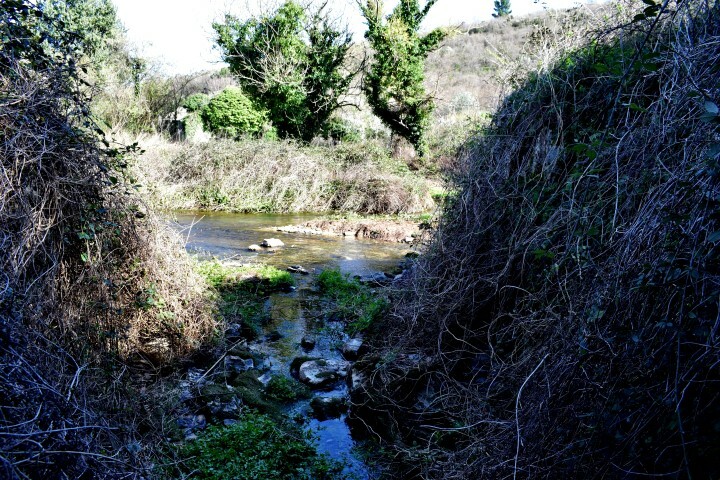 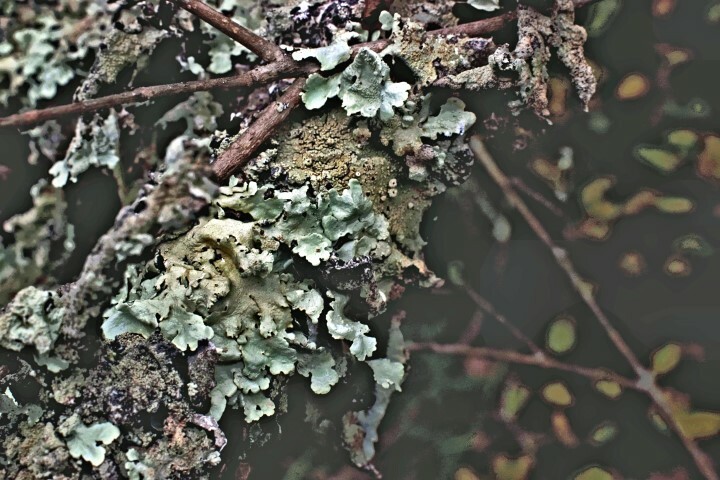 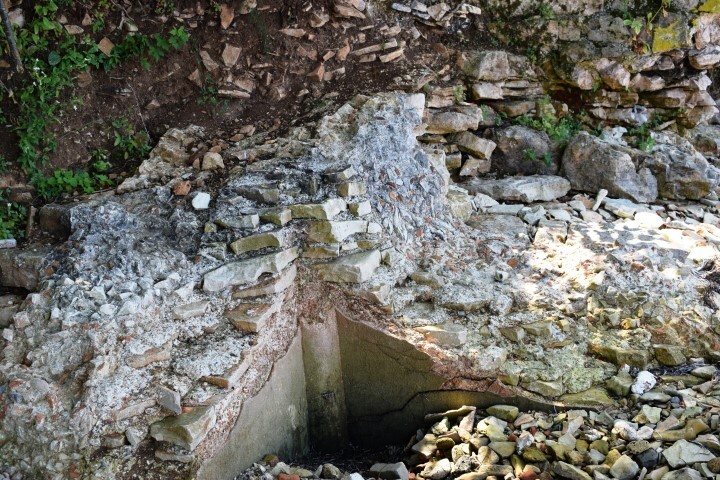 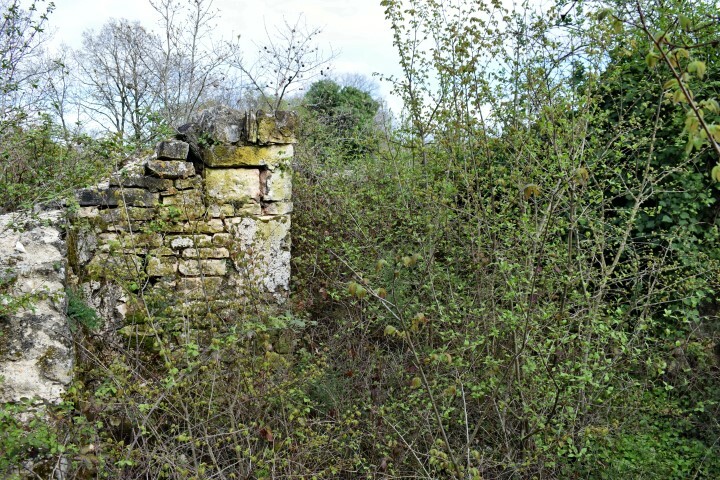 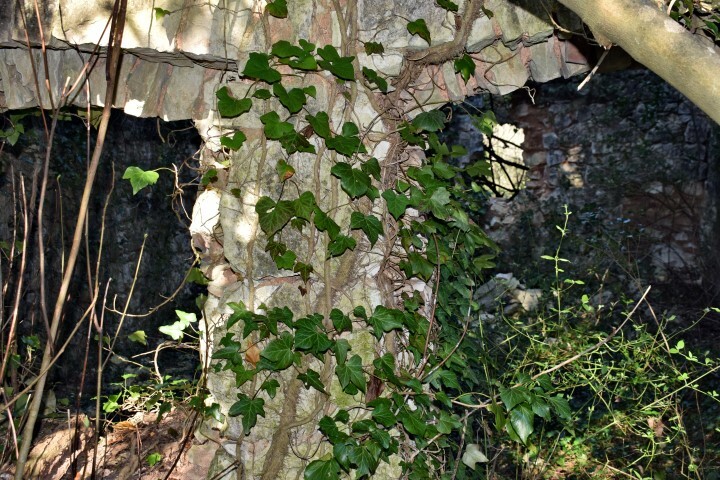 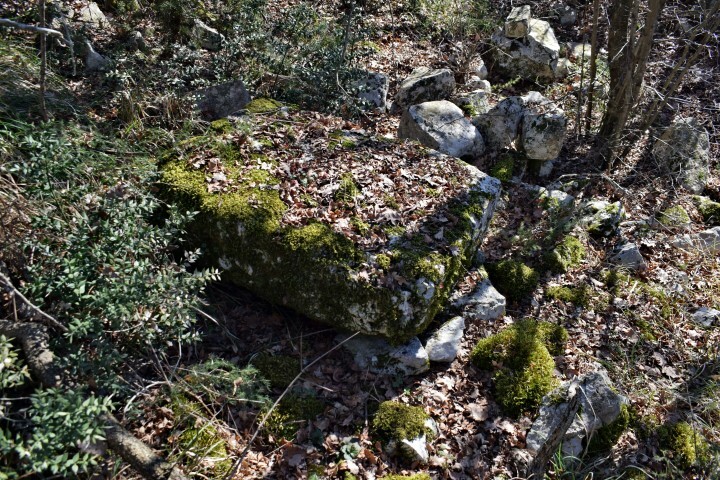 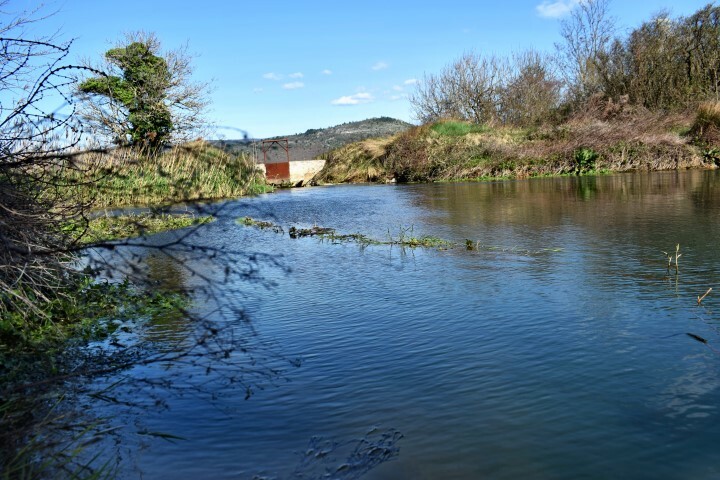 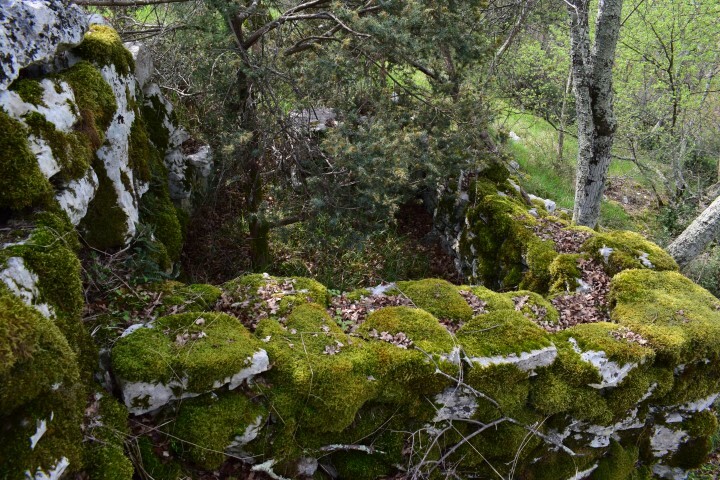 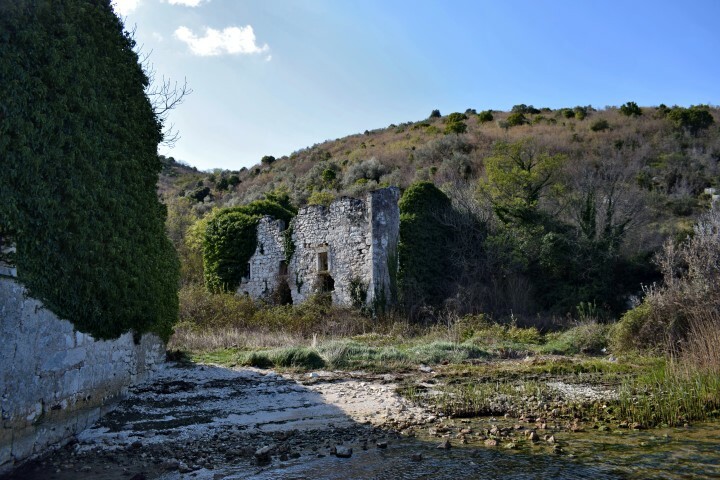 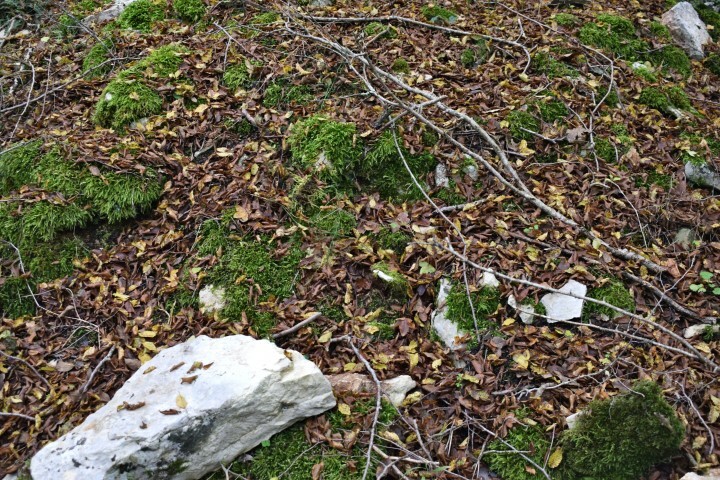 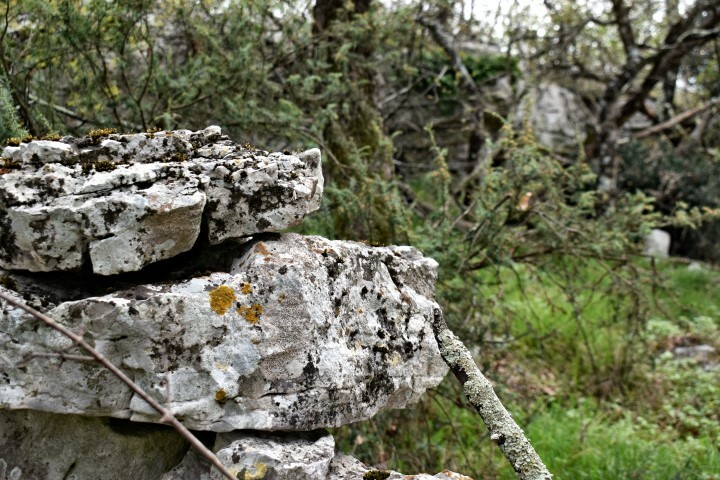 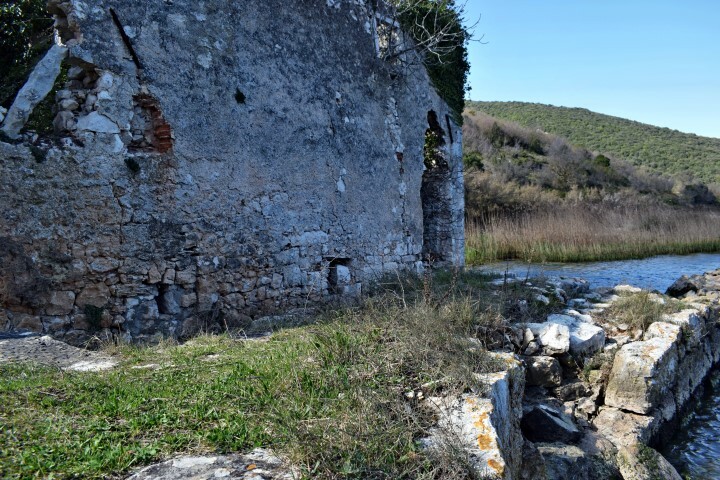 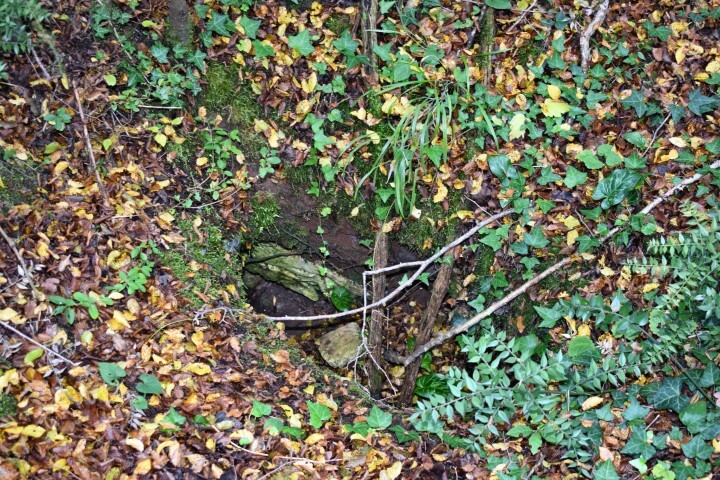 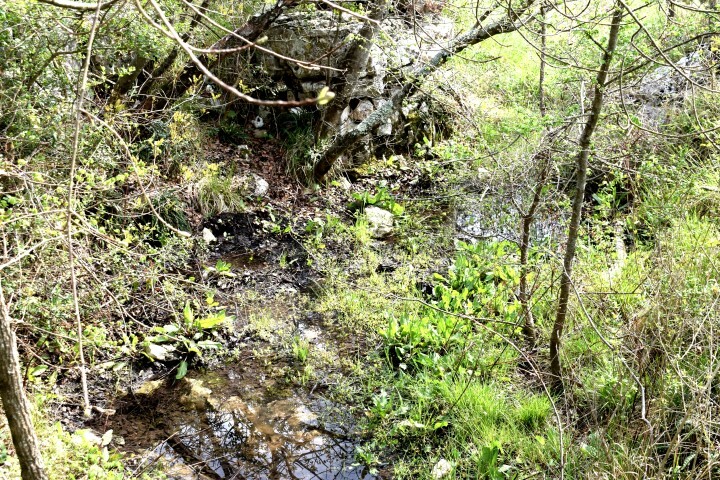 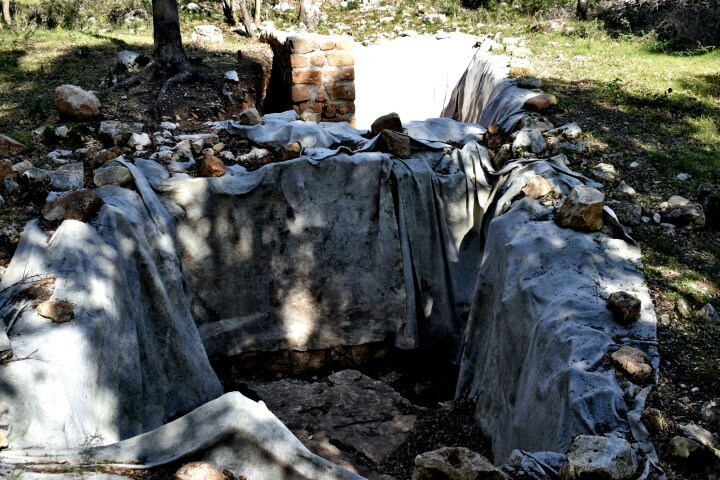 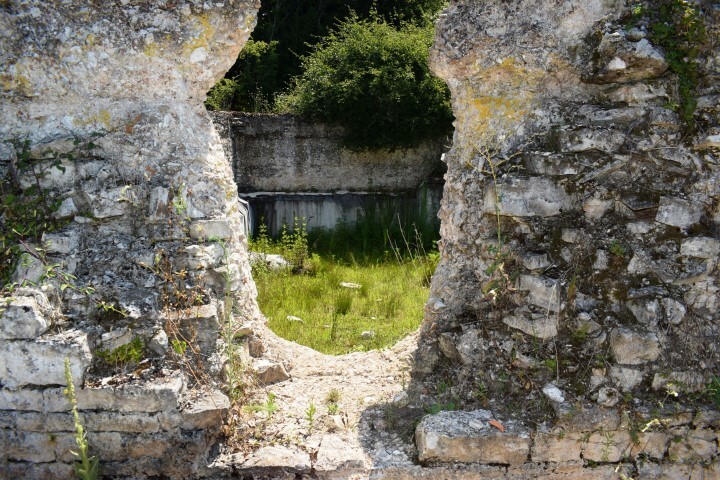 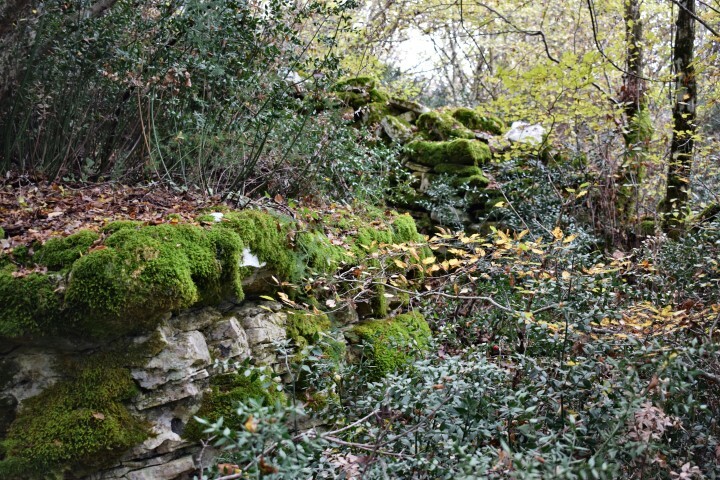 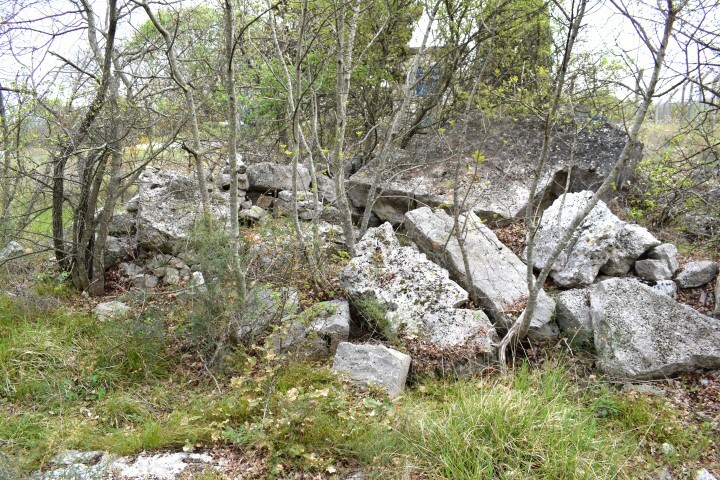 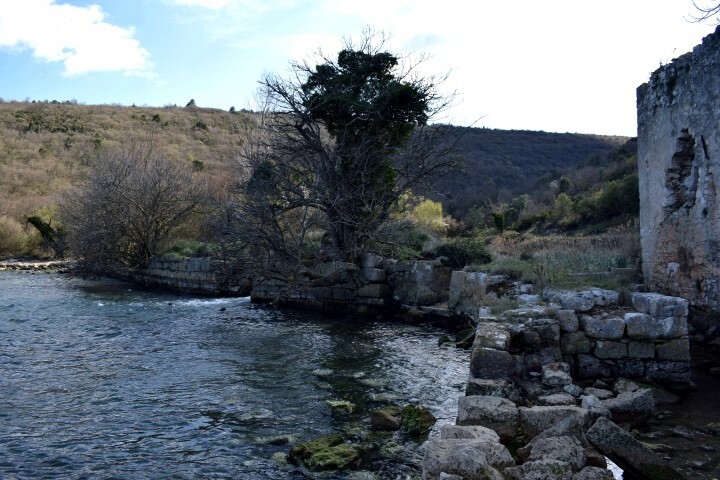 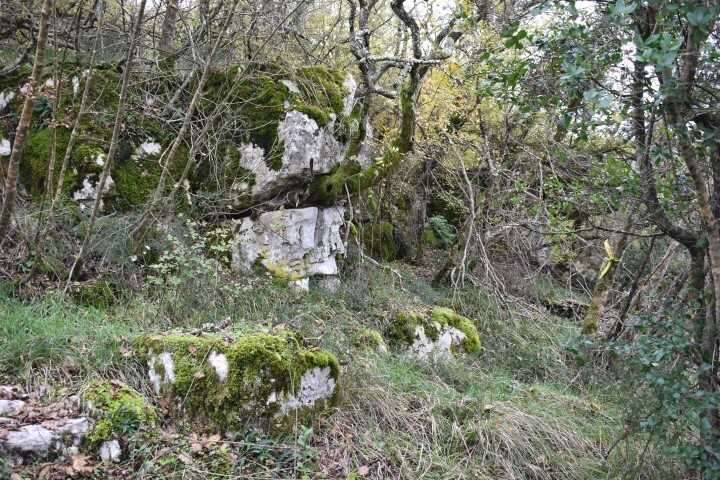 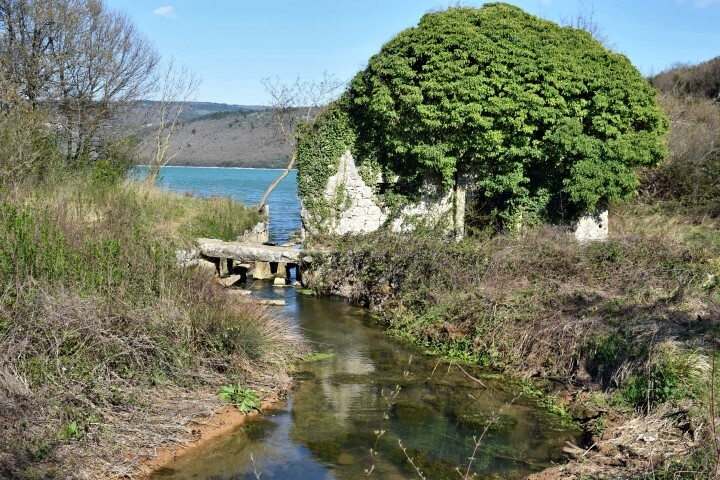 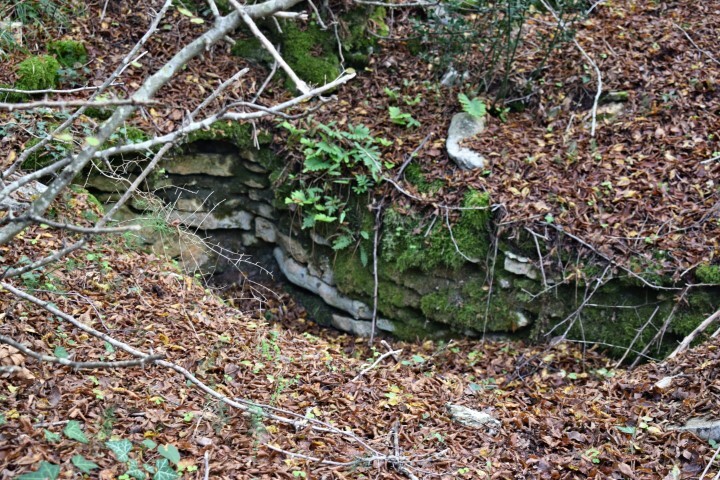 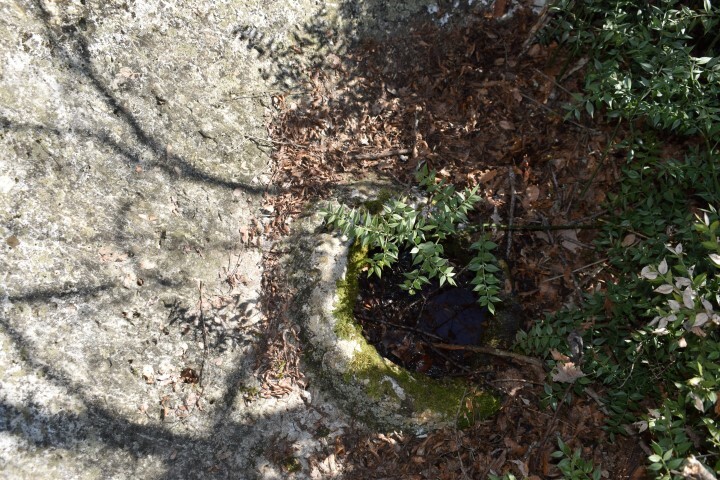 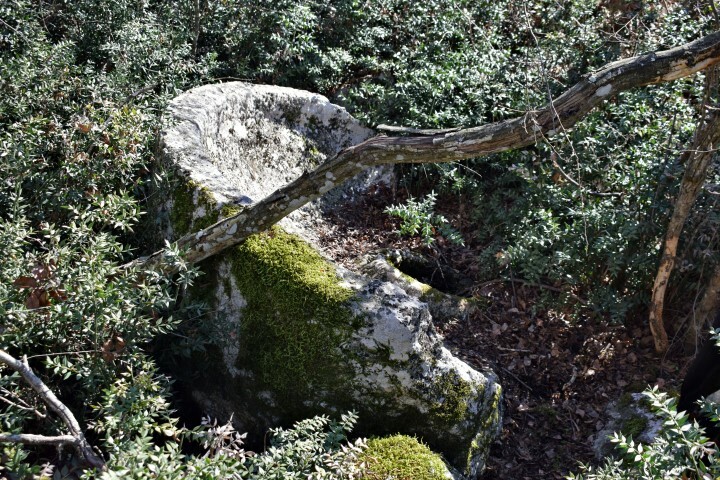 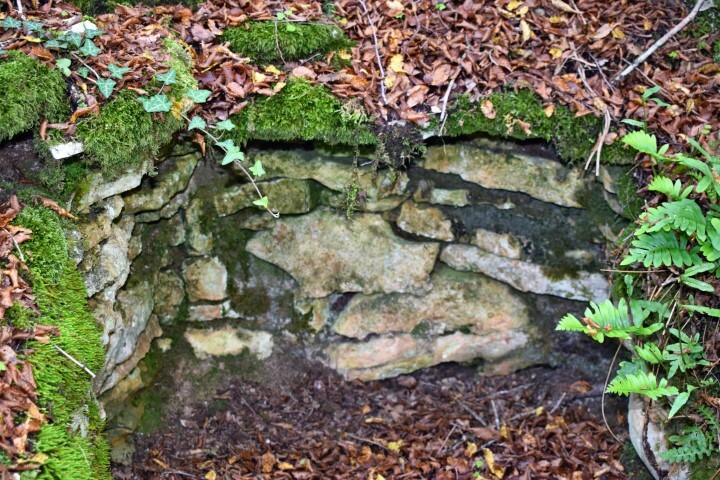 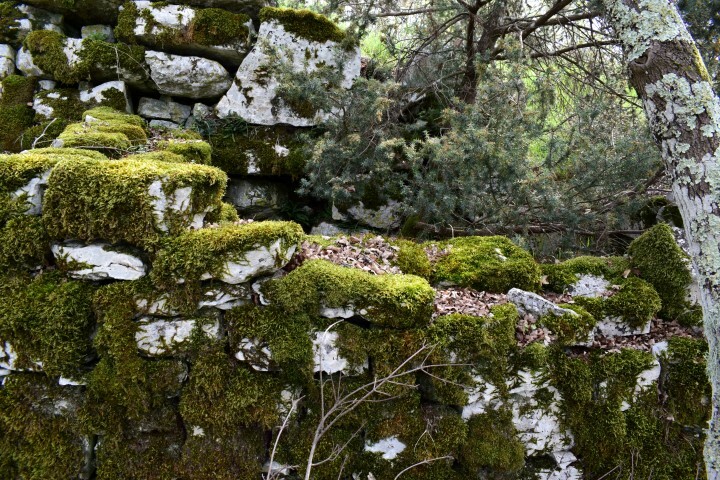 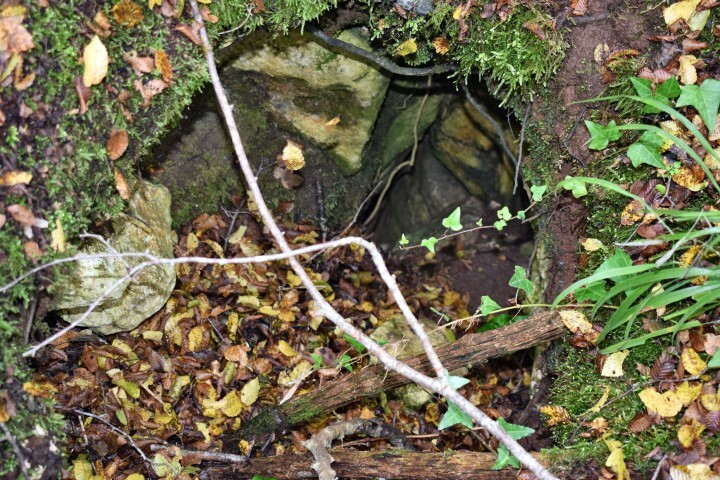 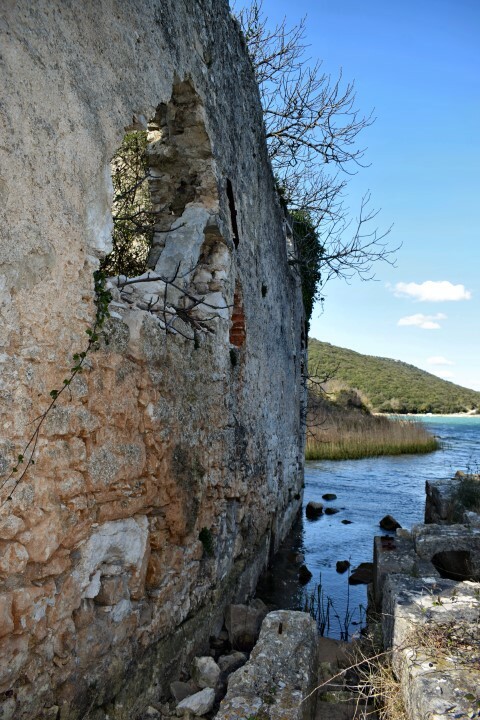 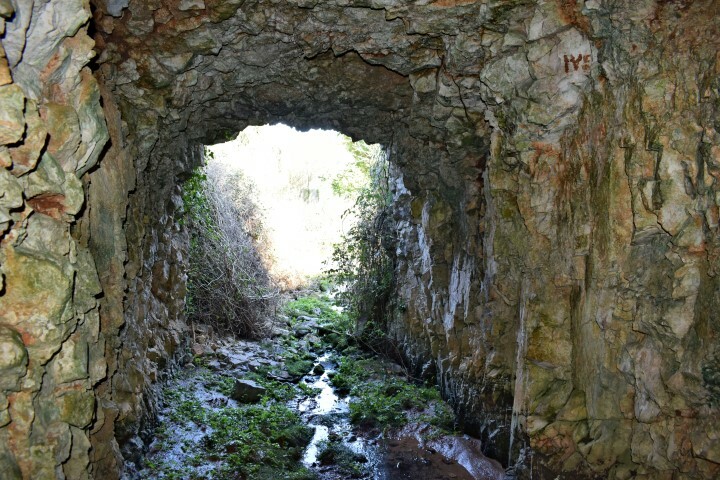 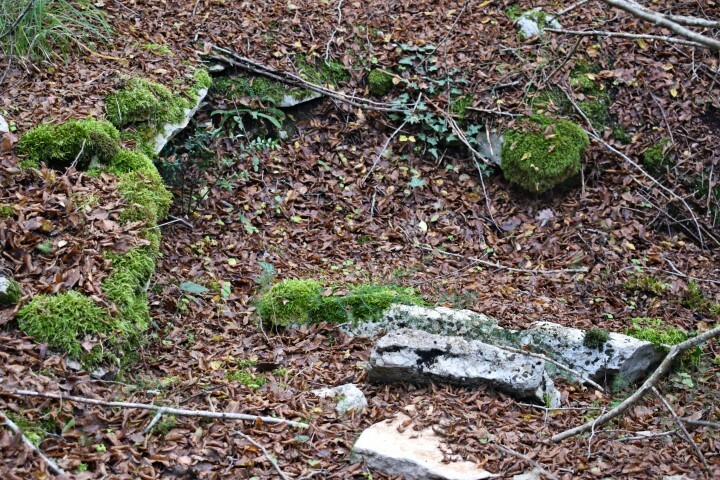 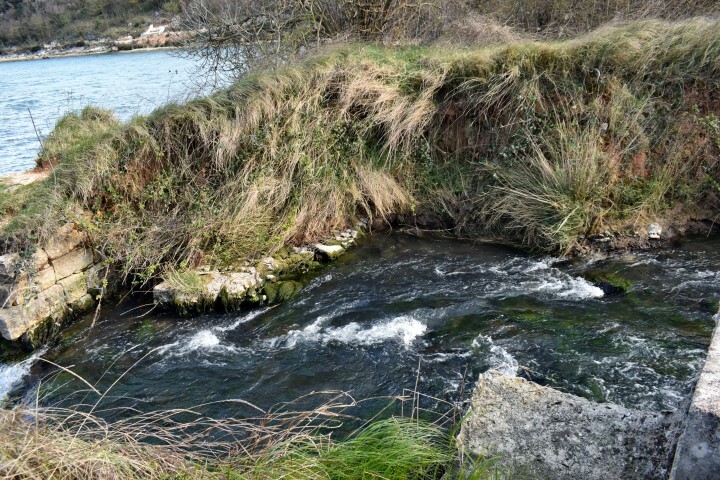 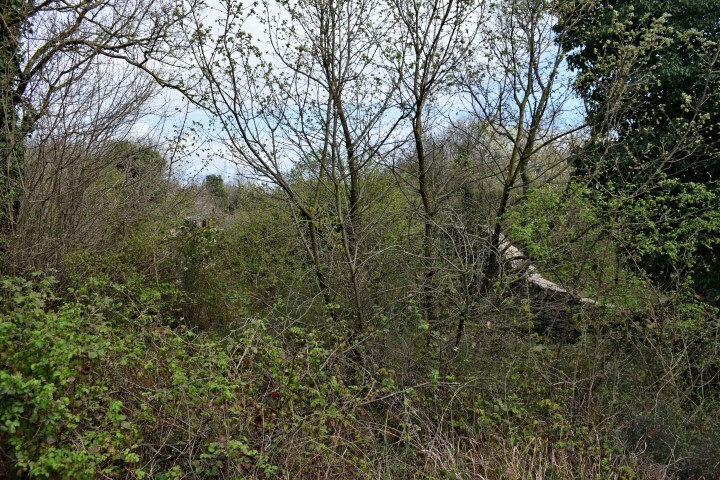 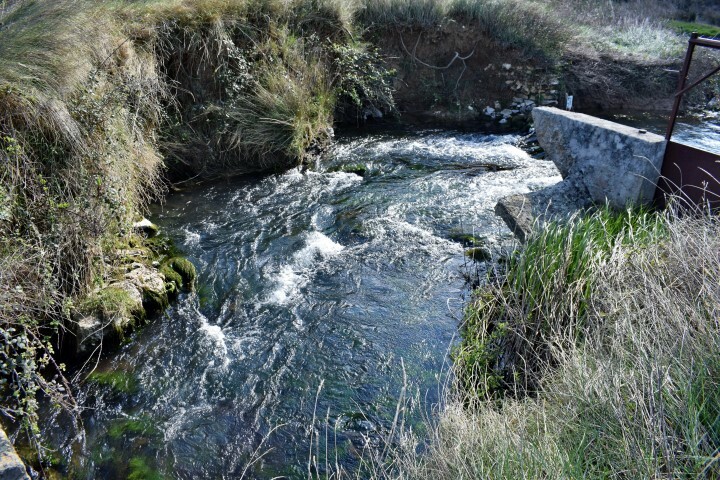 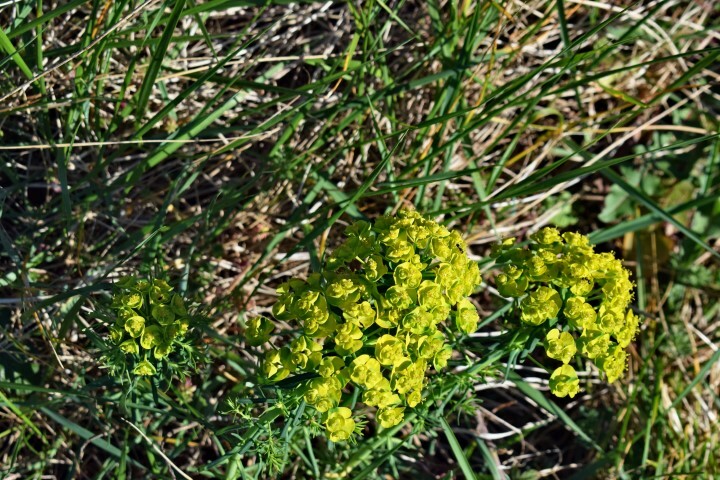 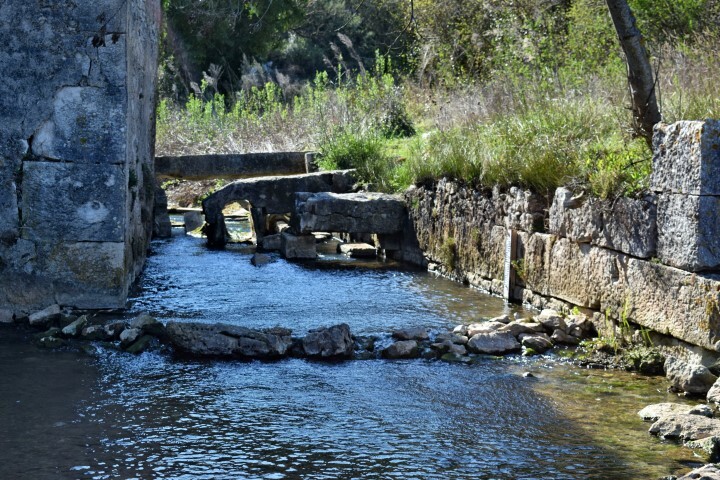 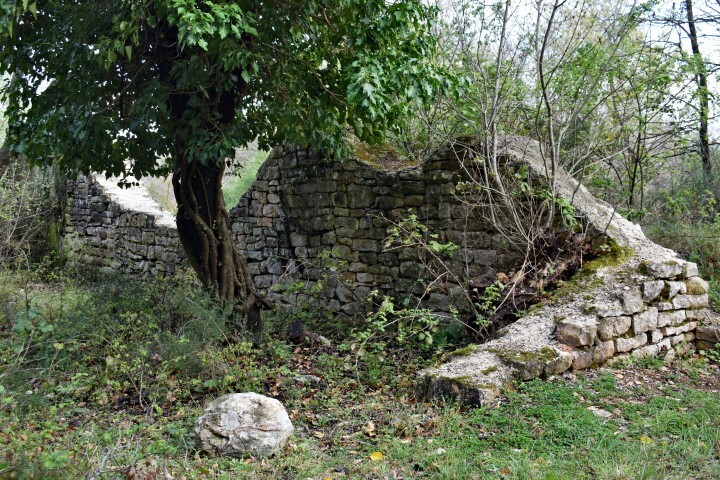 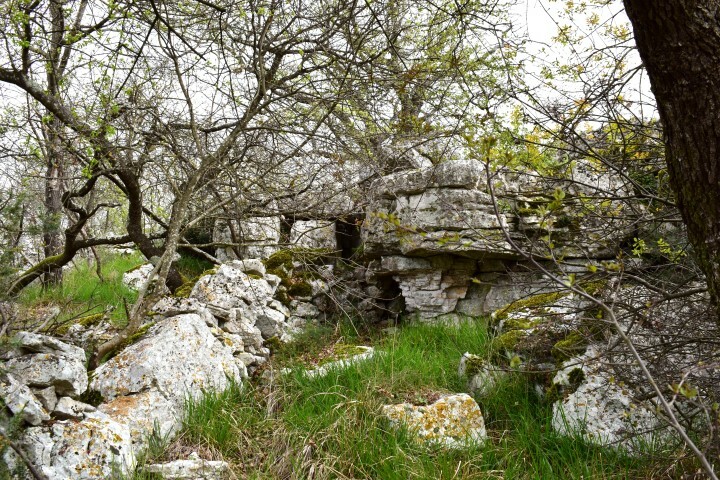 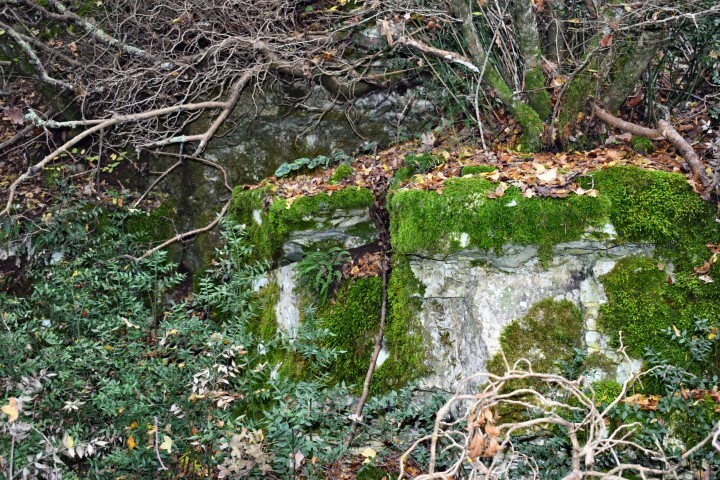 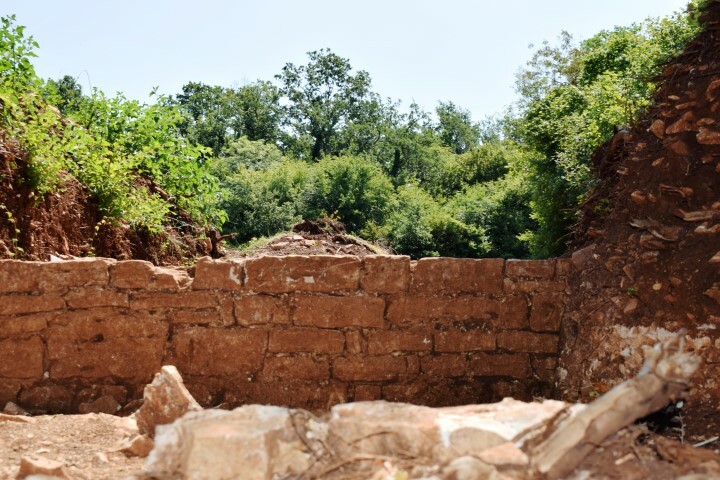 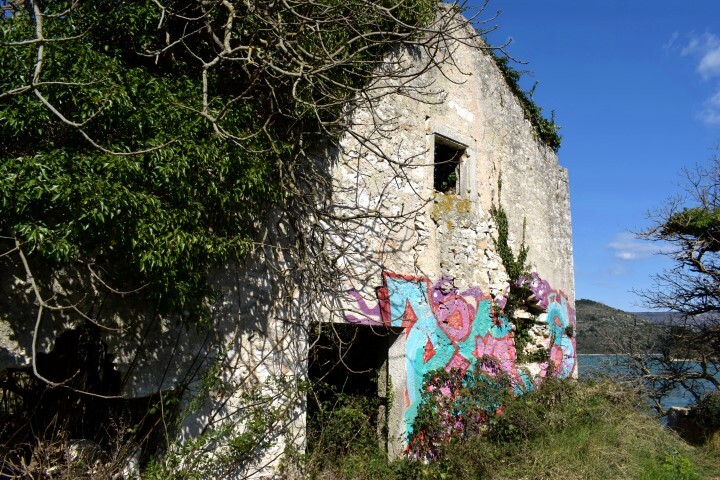 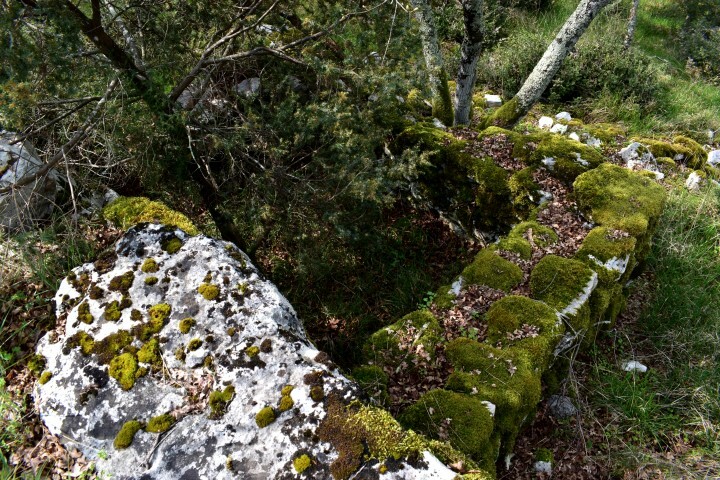 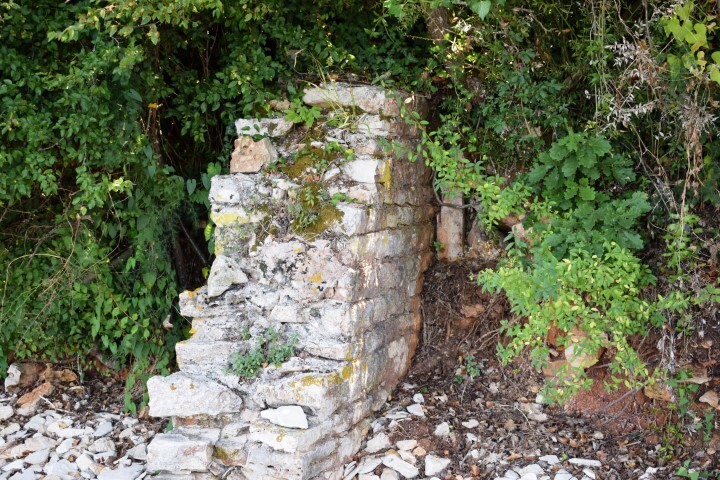 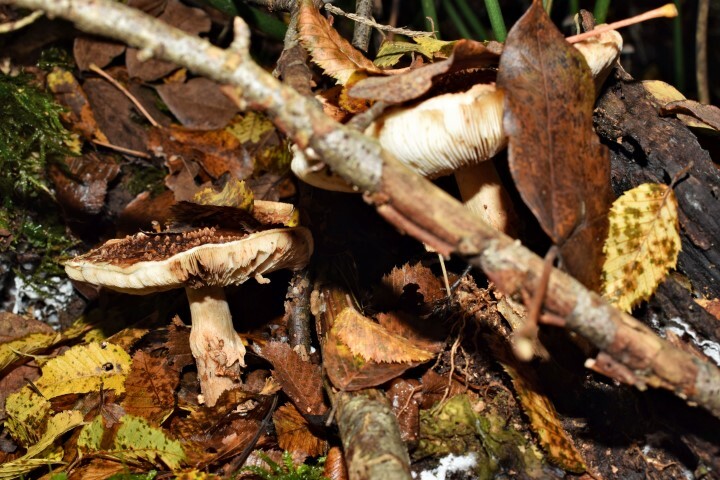 Coordinates: 45.15690 N – 13.62683 E.
Remains Olive mill / press Bruničevac. 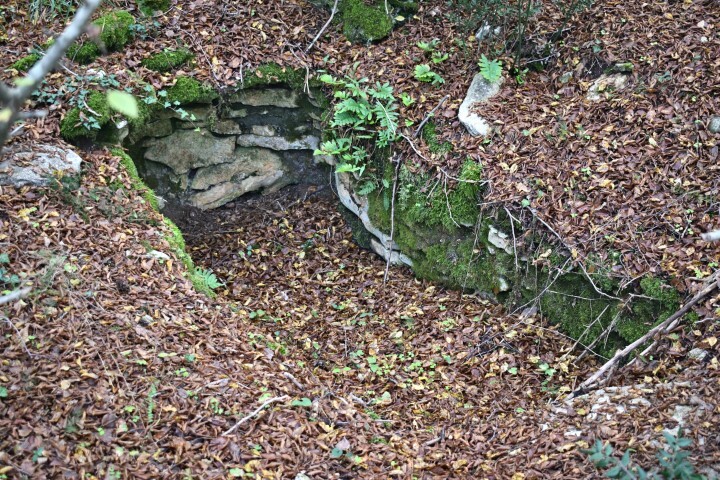 Name: Remains olive mill / press Bruničeva. 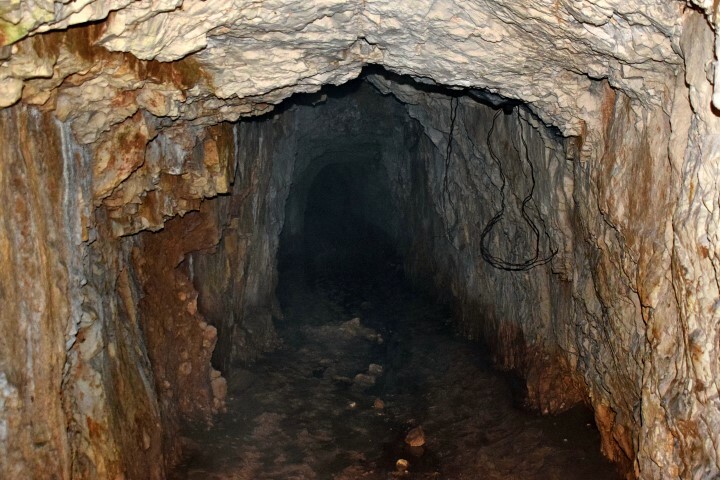 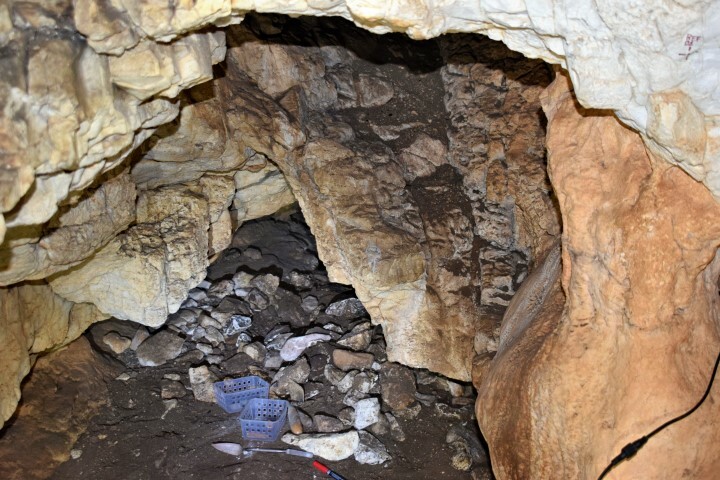 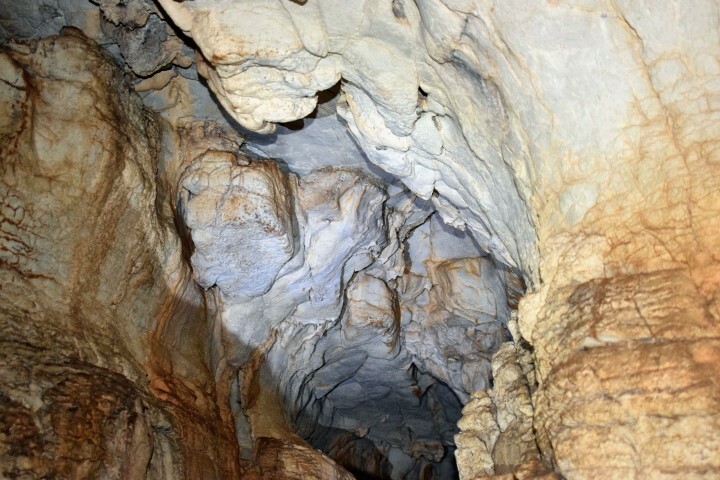 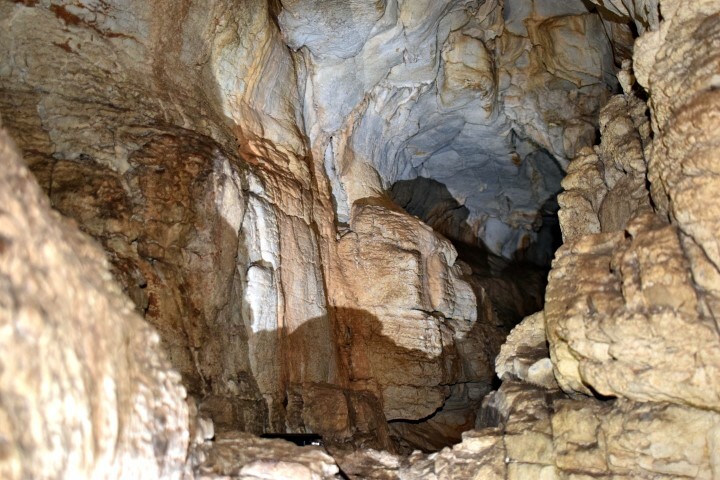 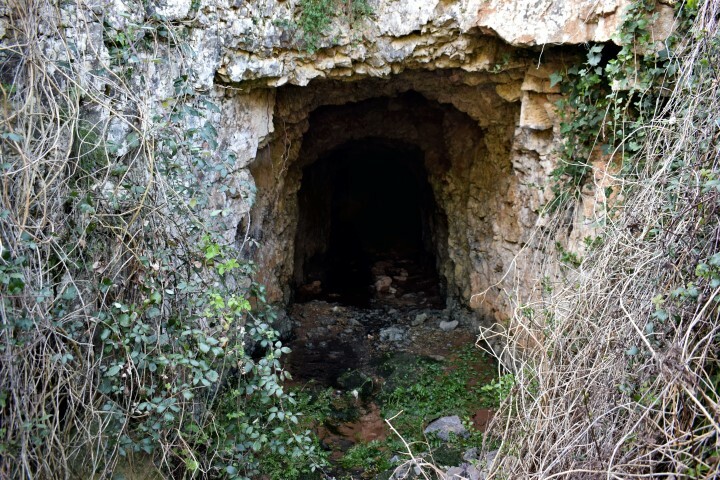 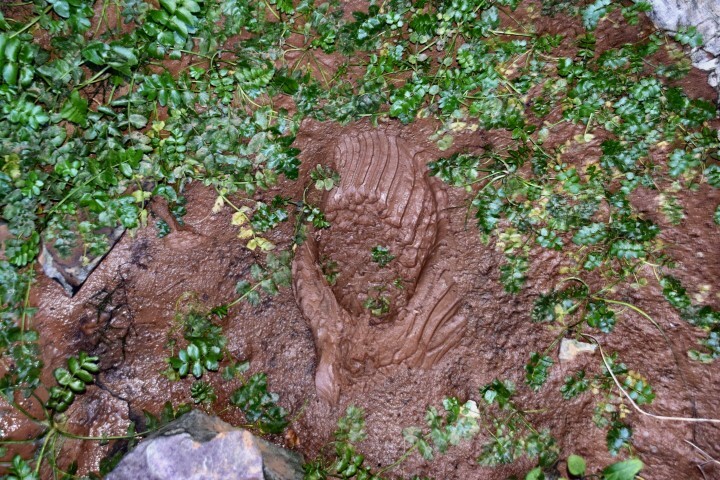 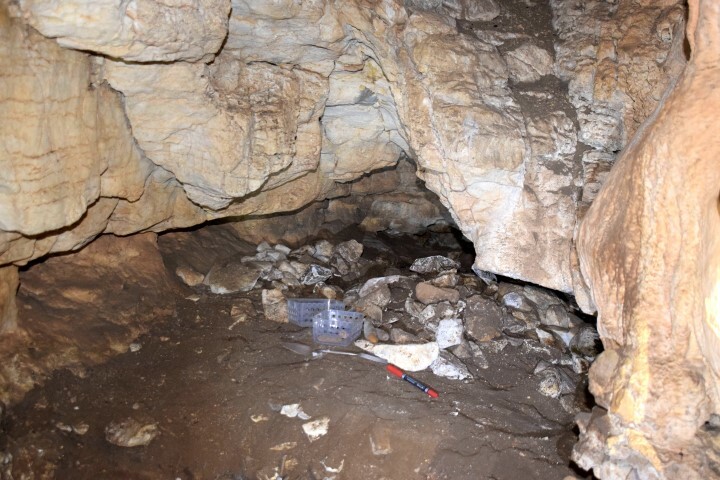 Name: Cave Lim 001 – Archaeological research. 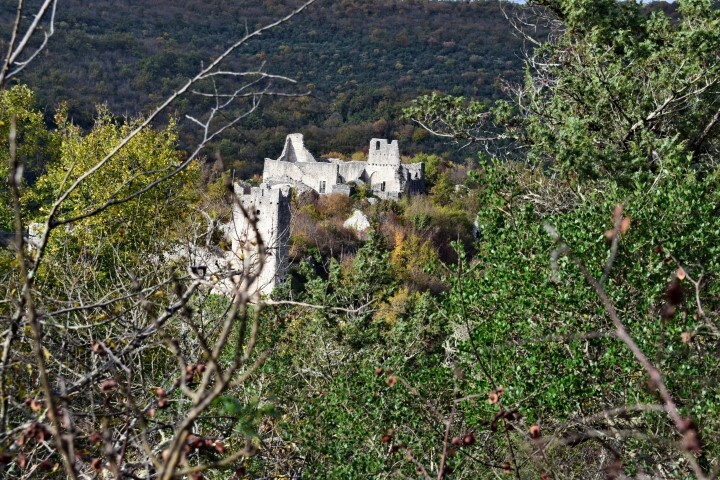 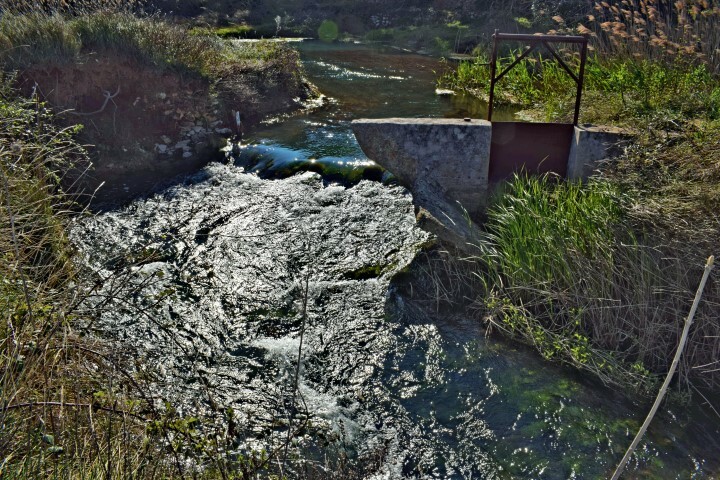 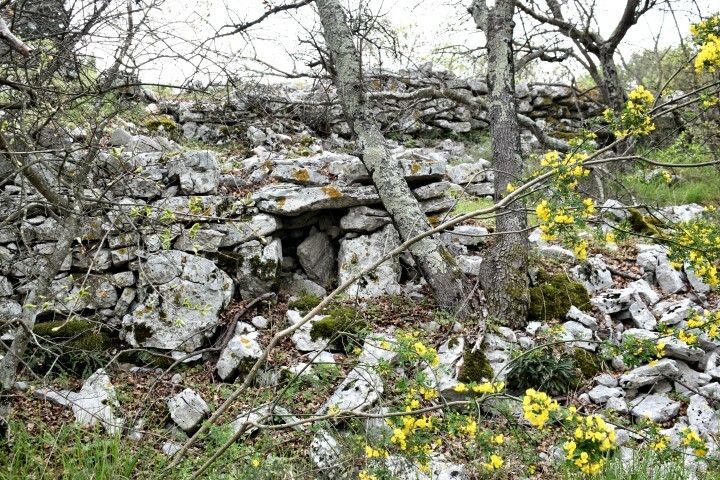 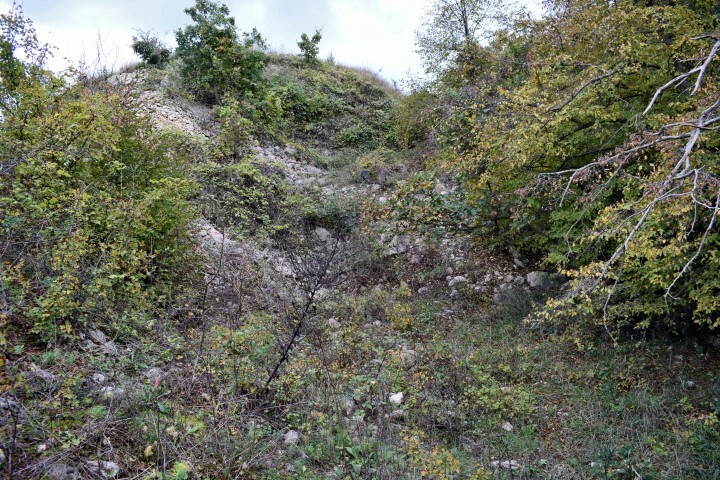 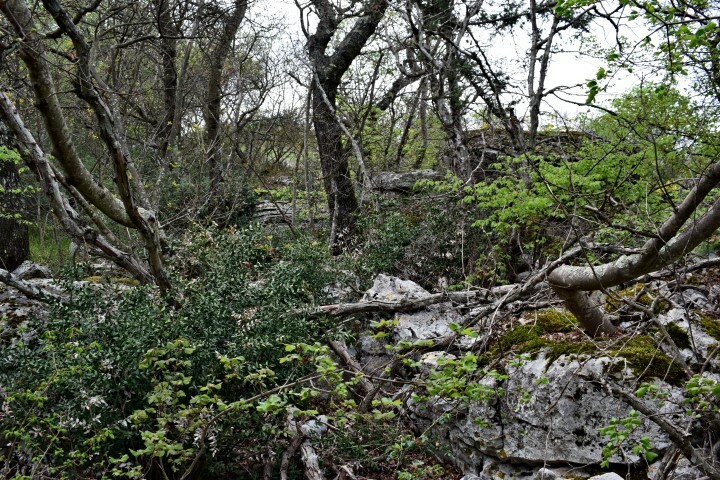 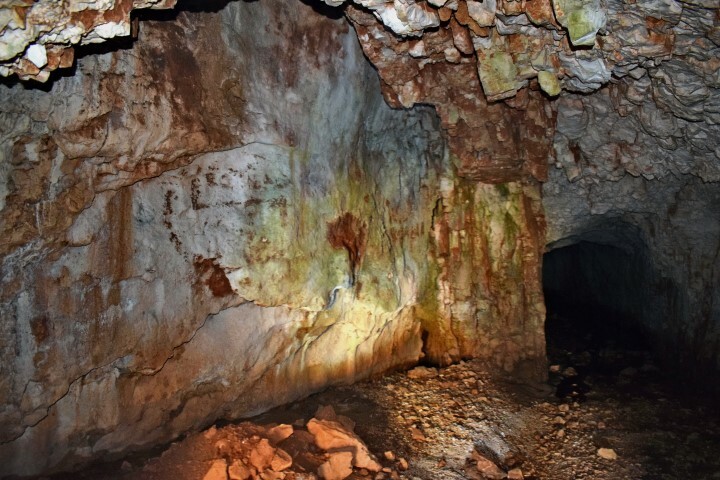 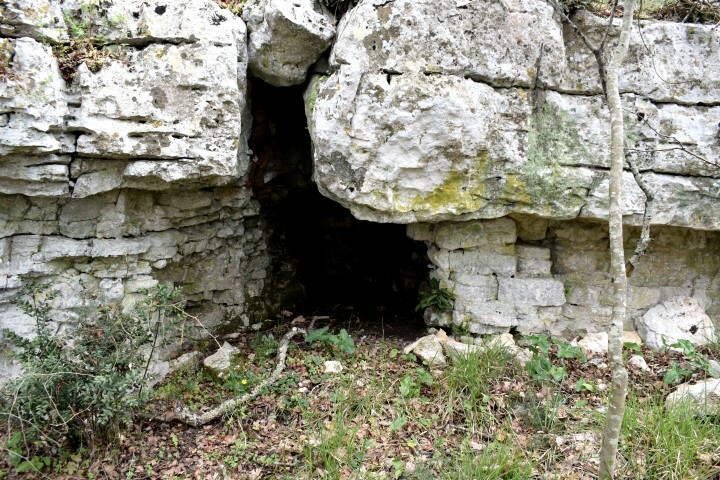 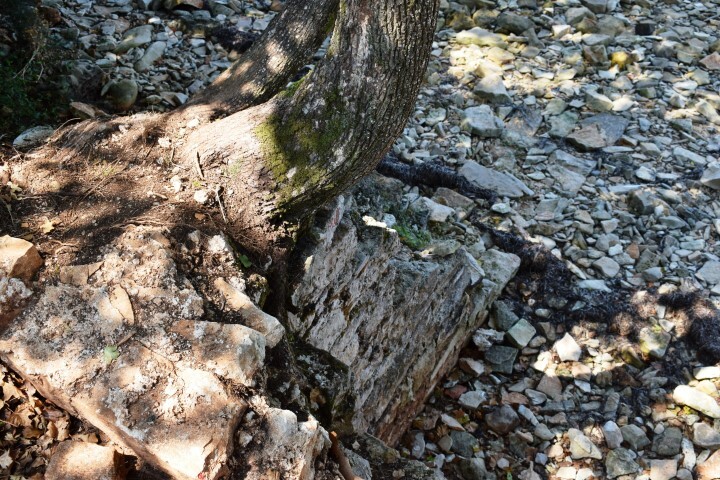 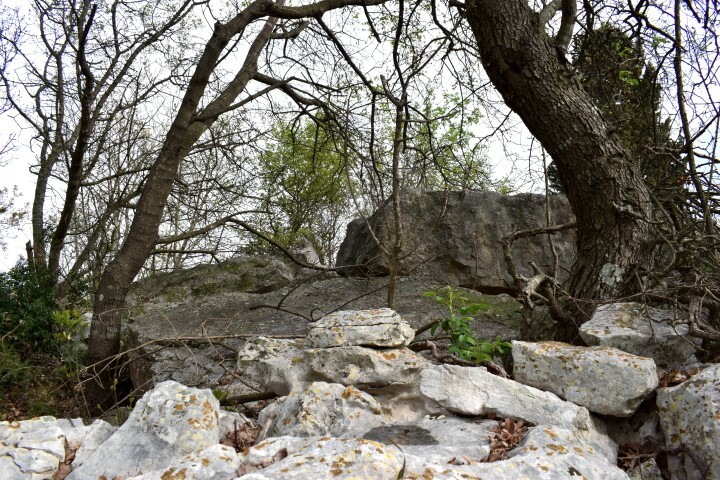 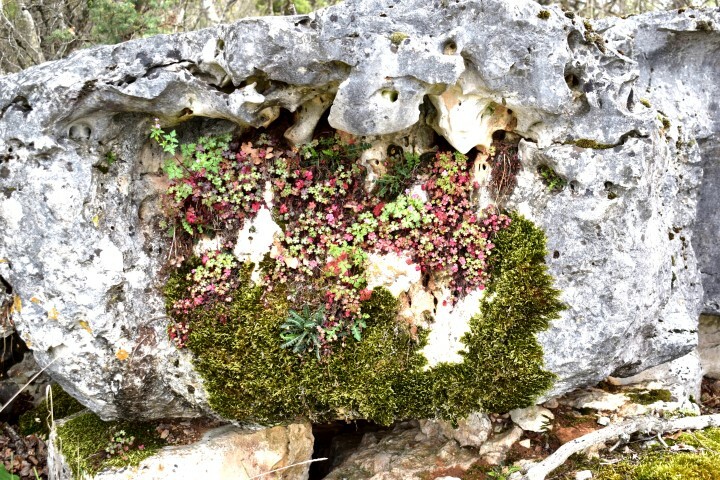 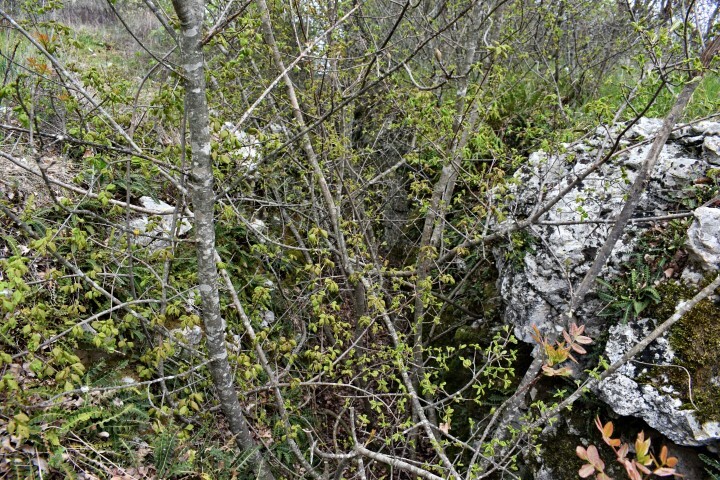 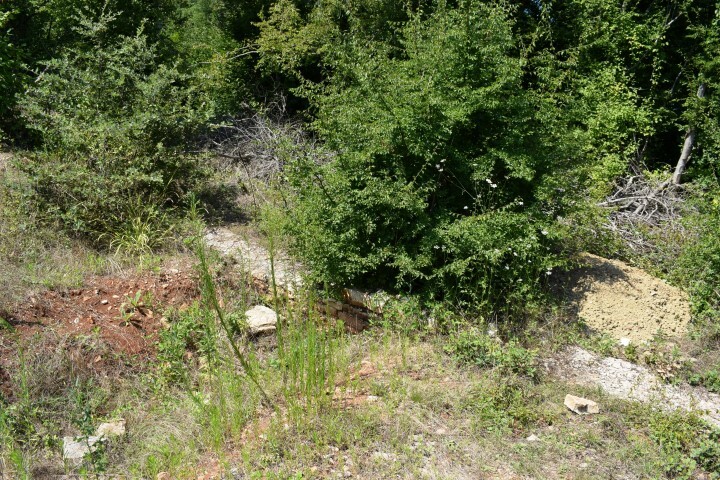 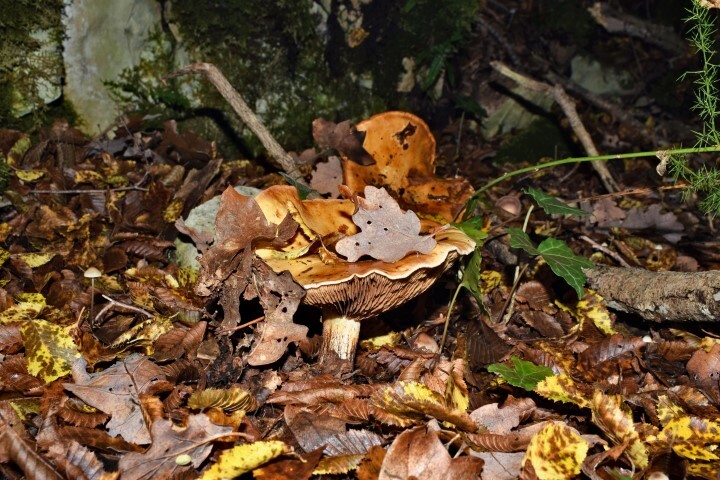 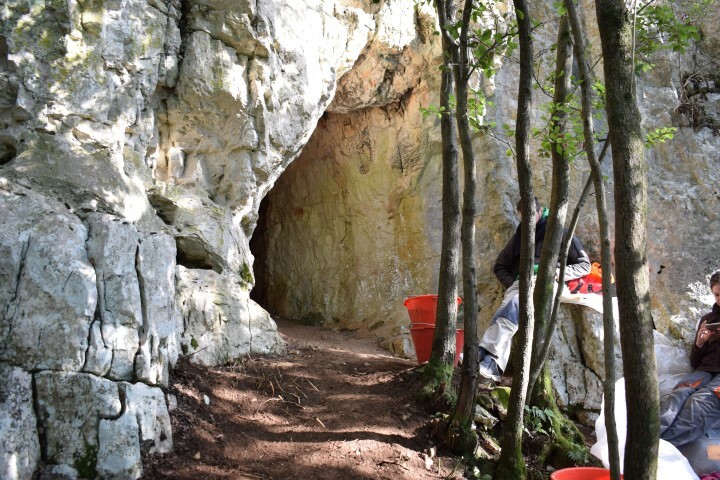 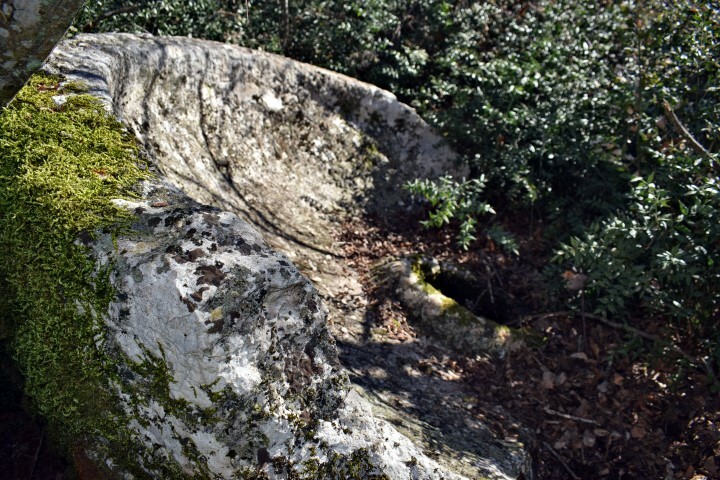 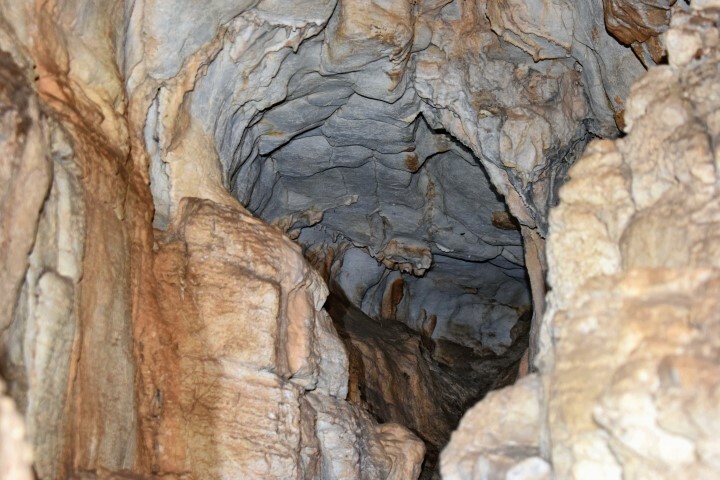 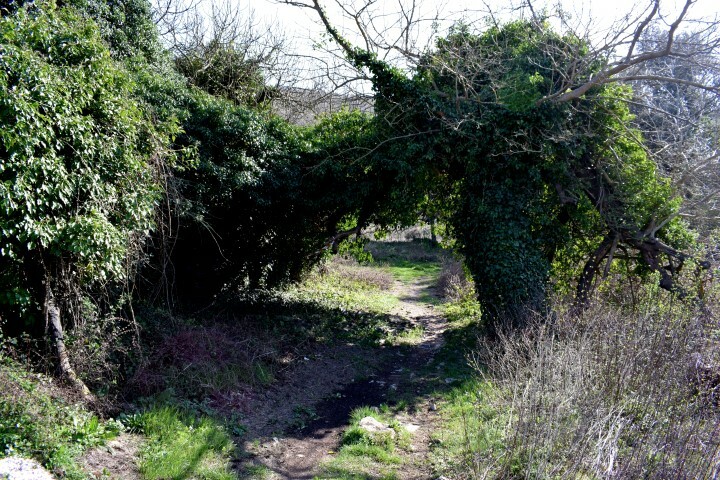 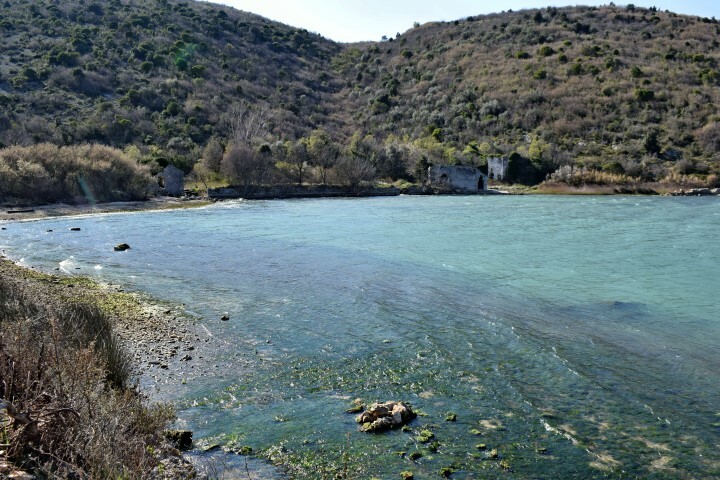 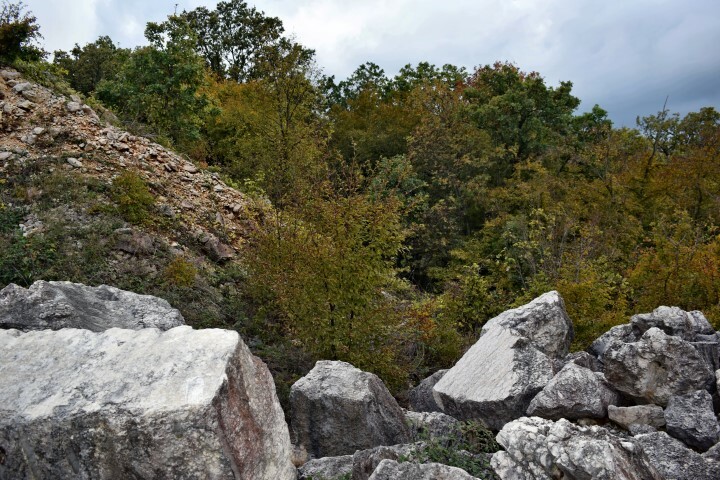 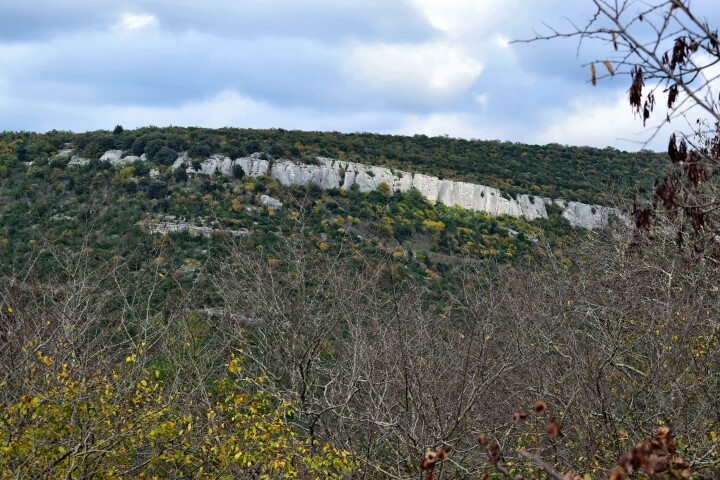 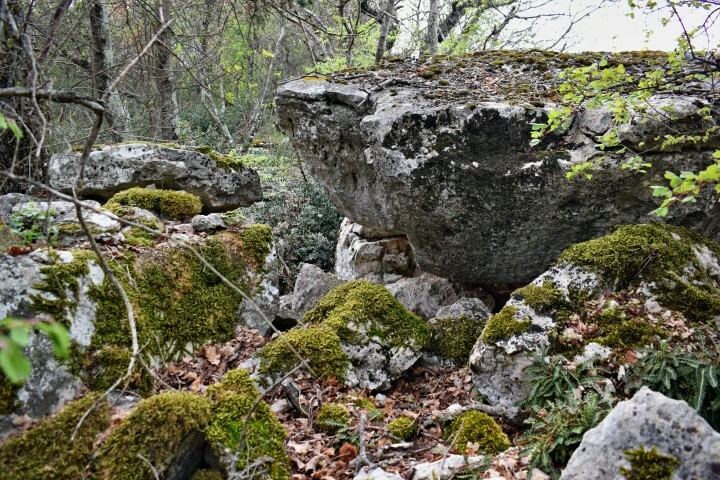 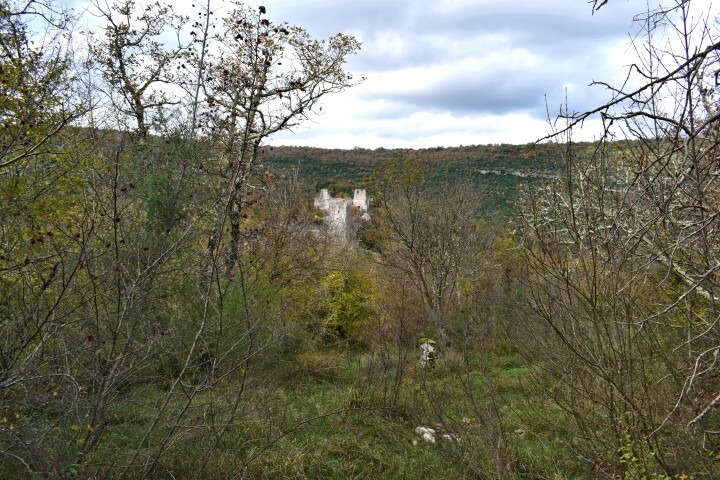 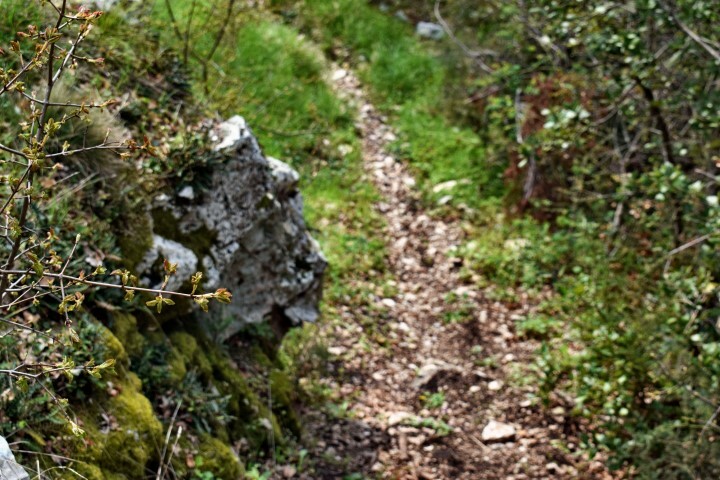 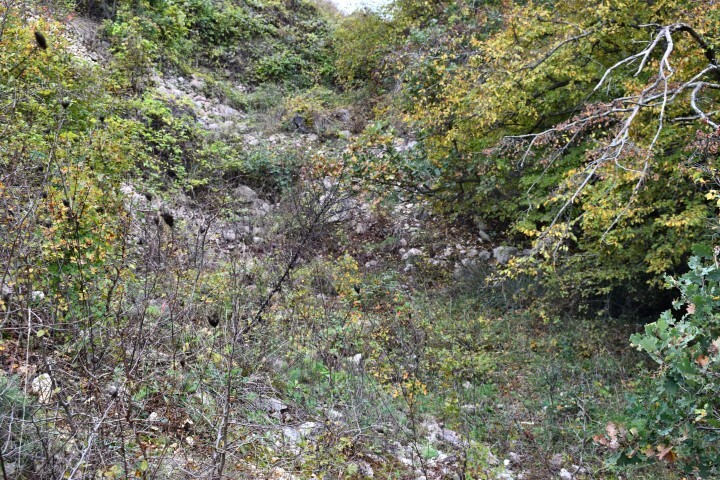 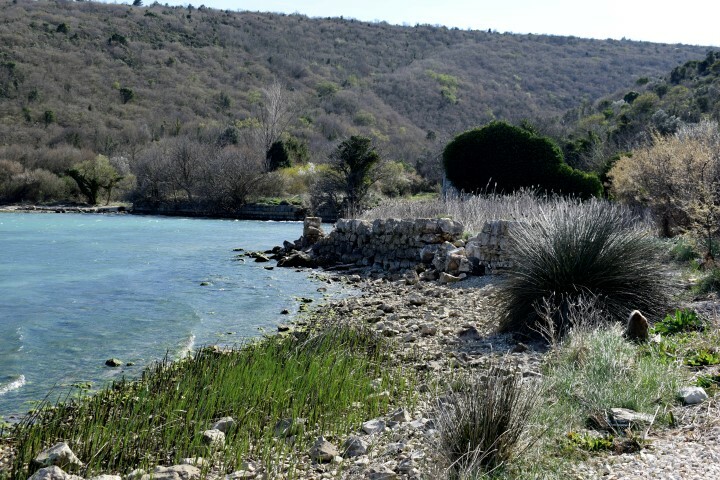 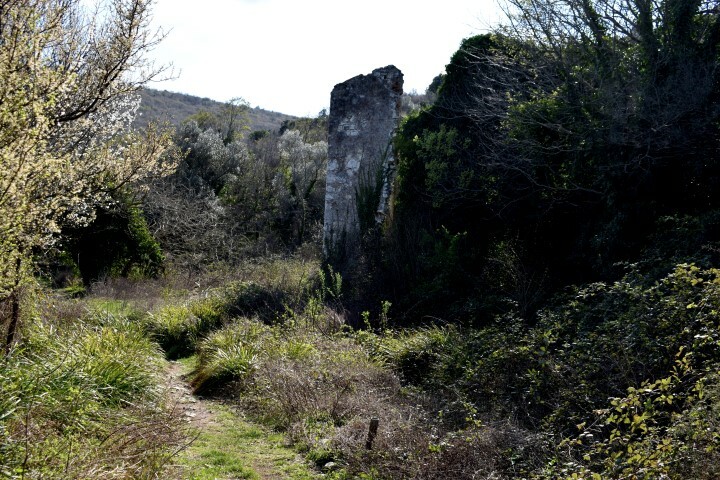 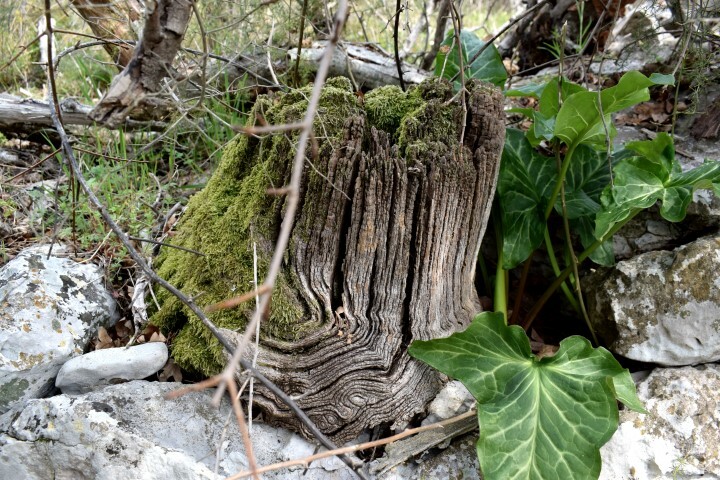 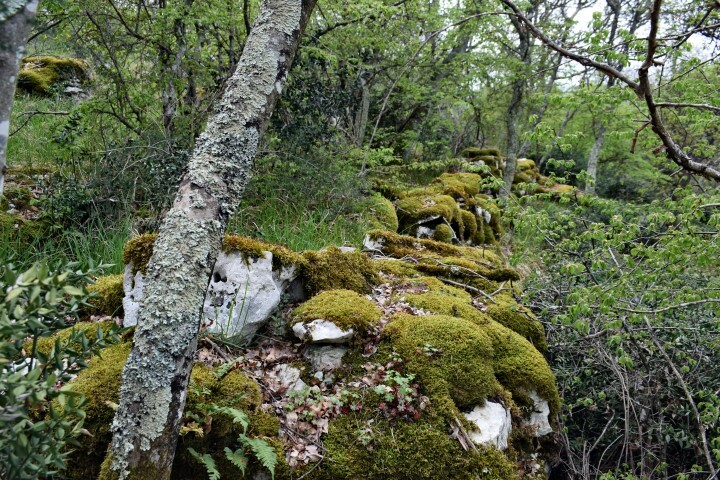 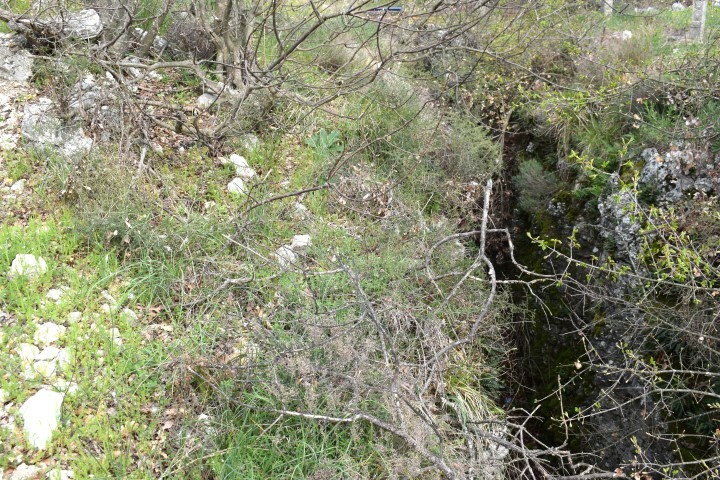 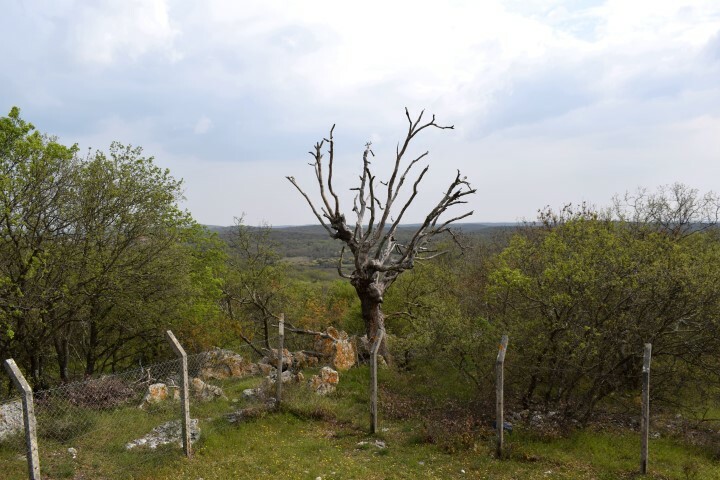 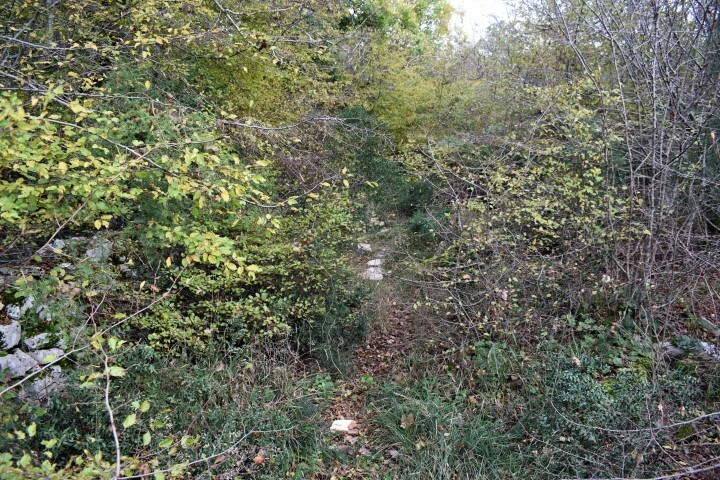 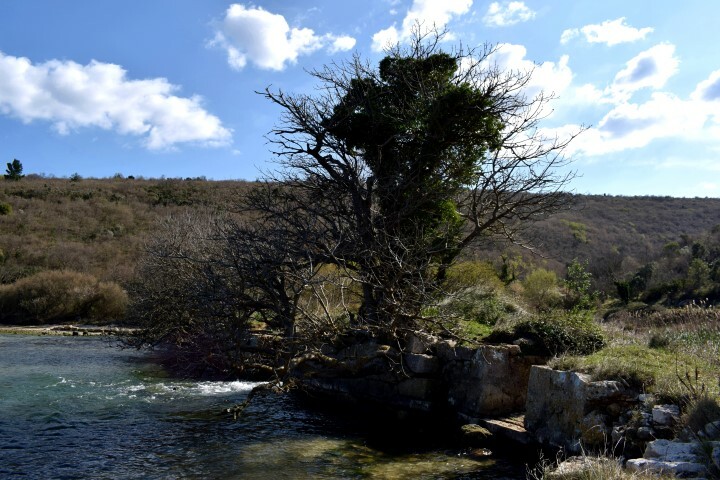 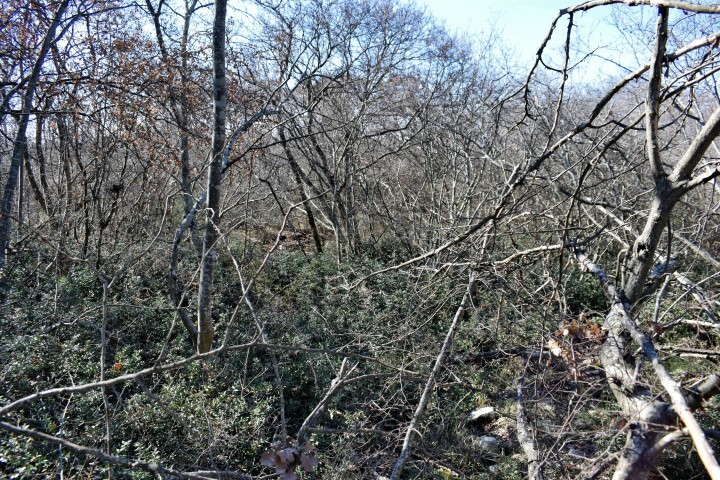 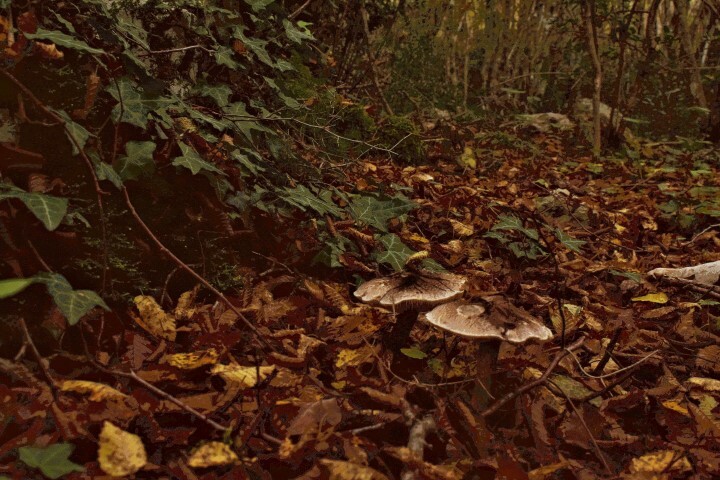 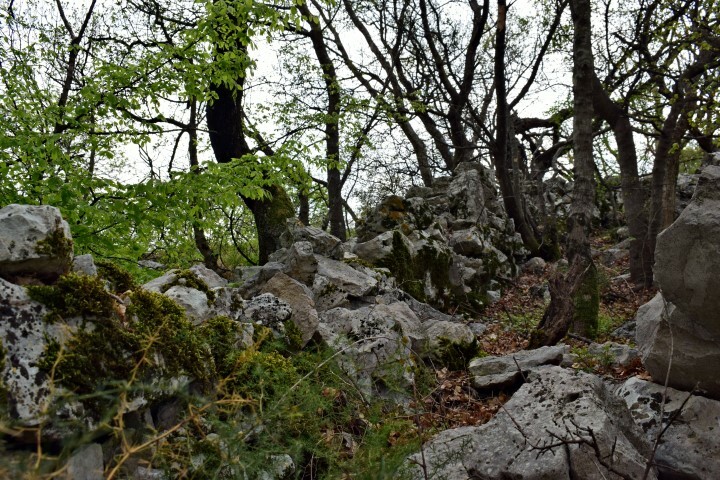 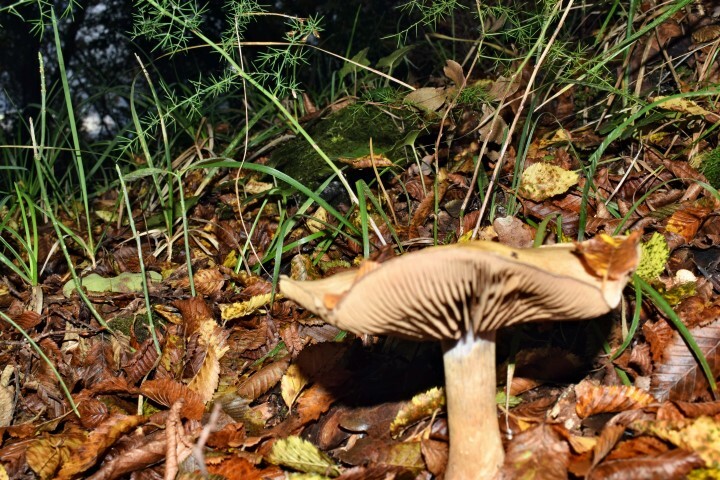 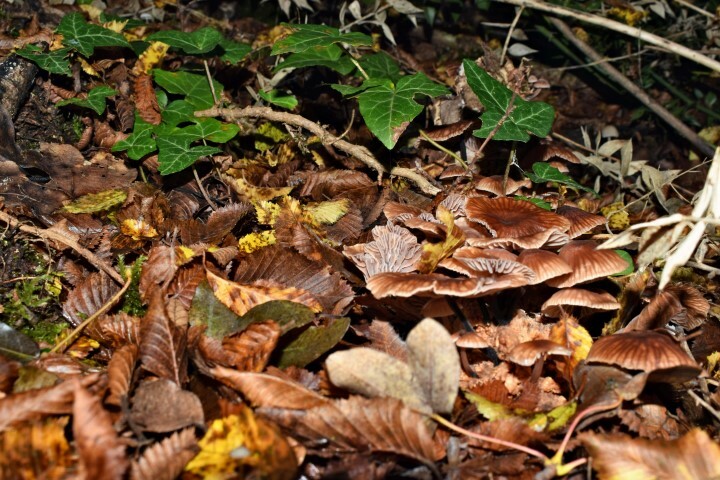 Coordinates: 45.13627 N- 13.72705 E.
Name: Hiking path (201) Parentino / Quarry near Dvigrad. 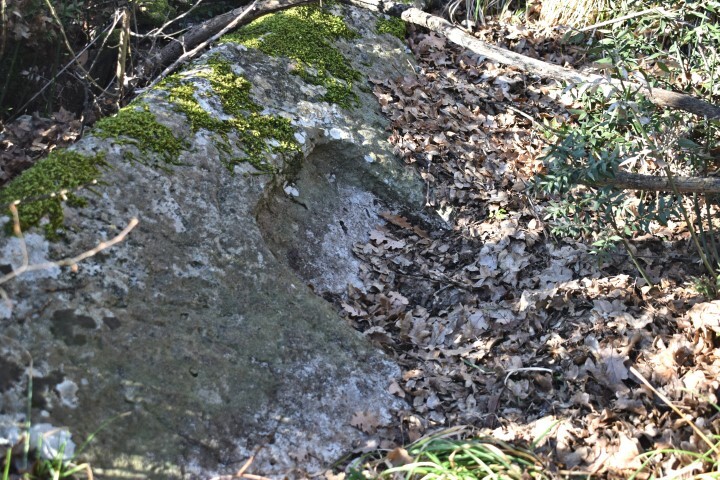 Coordinates: Starting point (201) near church St. Anton: 45.26031 N – 13.81327 E. End one direction to road 45.12280 N – 13.81822 E. The other to the quarry: 45.12127 N -13.81140 E.
Location after archaeological research from 27 June to 15 July 2018.